Oops, it looks like you’re in the wrong year! 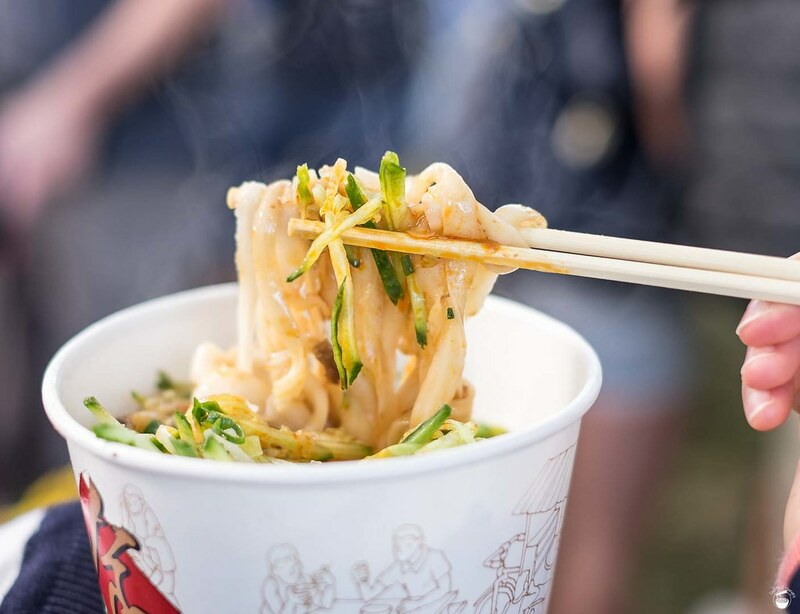 If you’re looking for my 2017 coverage of the Night Noodle Markets, click here! If you want to relive some old memories, feel free to read on! Folks, it’s that time of the year again. 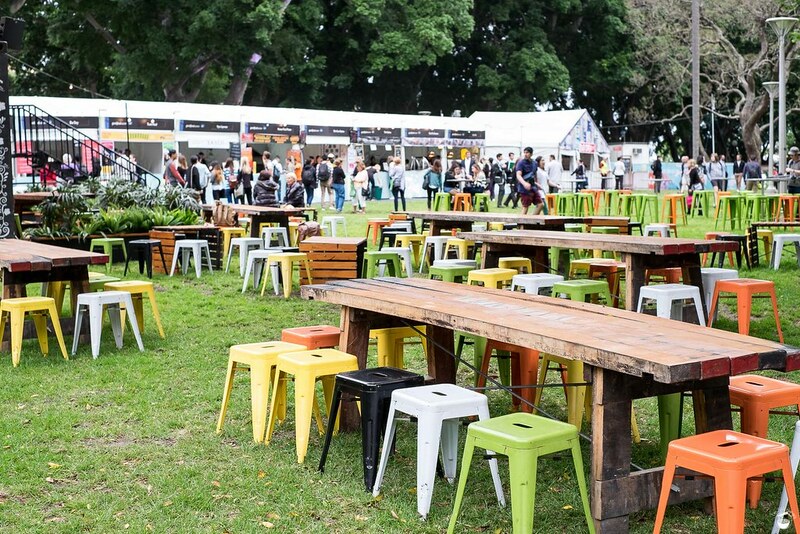 It’s time to get your slurp on for Sydney Good Food Month’s highlight event! 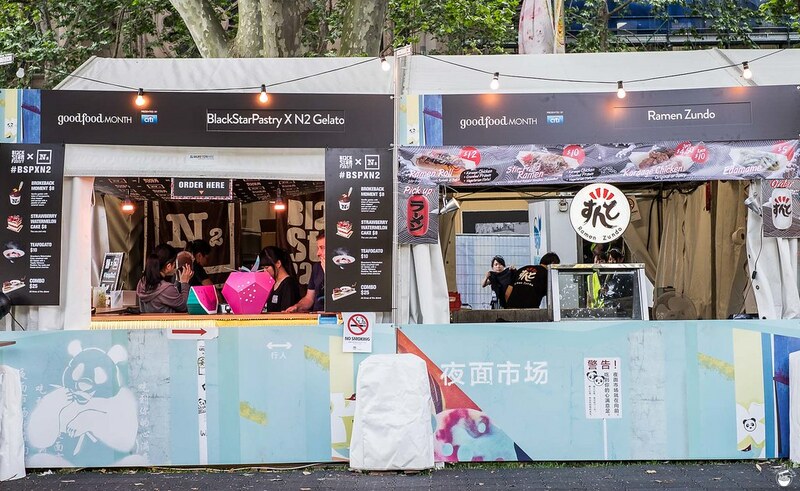 Although, if you’ve read my coverage on 2014 & 2013‘s iterations on the Sydney Night Noodle Markets, you’ll quickly pick up the irony at how few noodle dishes I actually consumed. Thing is, the NNM is all about three things: atmosphere (company), variety, and last but just as important – novelty. With that in mind, my coverage will try and cover primarily whacky/must-try dishes that may not be easily obtained elsewhere. Naturally, I will still pay lip service to a few old favourites – nothing wrong with a little bit familiar comfort! 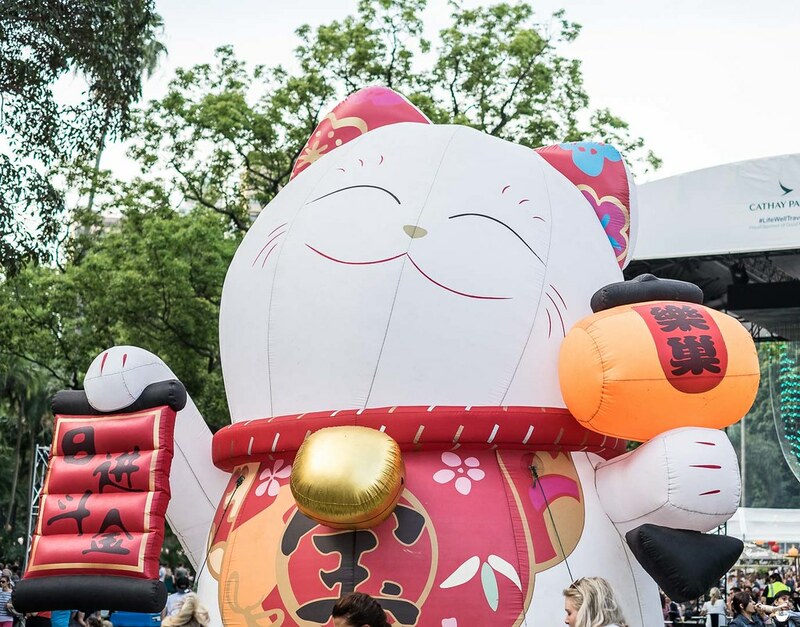 Now, let’s get reporting – your unofficial but hopefully super-comprehensive guide to the Night Noodle Markets – to be frequently updated! To navigate, I have provided a table of contents with the stalls I’ve visited. You can always jump back up using the “Back to Top” link at the bottom of each entry. Every time I make an update, the new content will be shown in green text, with previous green text demoted to standard black text – hope that helps! 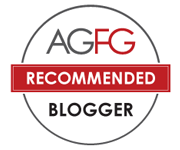 On recommendations: most dishes in this post are of the “try at least once” kind. If I truly think a dish isn’t even worth trying for the first time, I’ll be sure to note it! Arrive early. 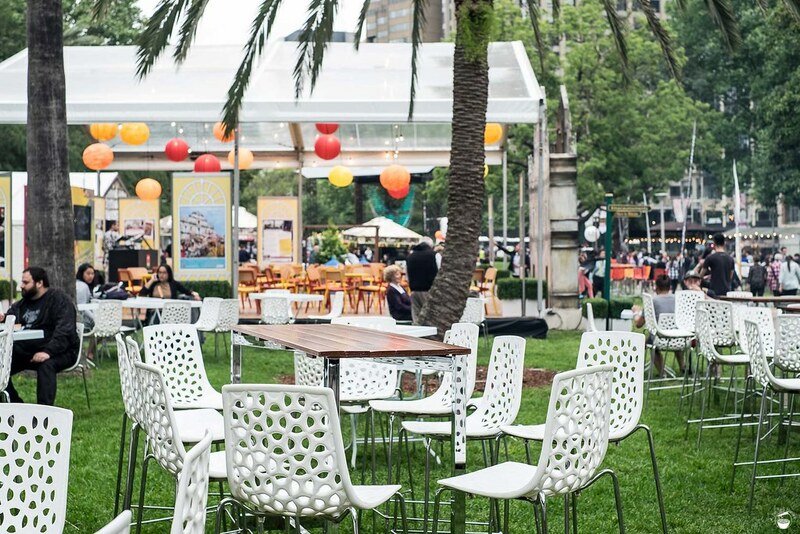 Seriously – if daylight’s running out, then so will seating. Bring/take LOTS of serviettes – whatever you think you’ll need, take triple! Bring hand sanitizer – it will be invaluable. No BYO – bags are checked! In a group? Split the effort – every man and woman to a stall, and meet back in the middle. It’s everybody’s favourite Korean taco joint! This is the third year Poklol’s run a stall at the Night Noodle Markets, so you know that they’re doing well. 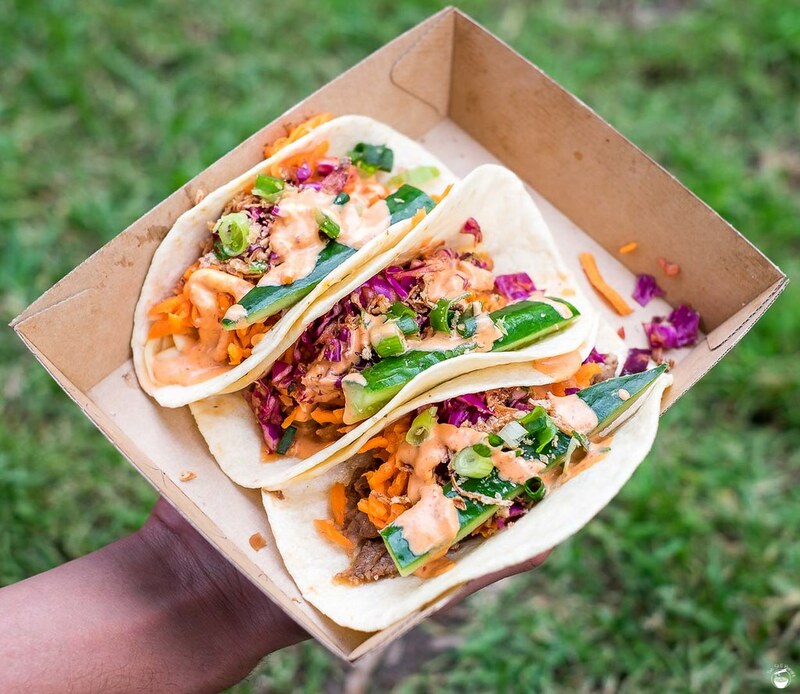 Their signature has always been the Korean tacos, featuring a base of kimchi slaw, topped with meats of your choice. Of course, you can also go meat free all the same. While I knew what to expect, I couldn’t resist – so for the third time in a year also, I bring myself down to treat myself. As usual, Poklol’s tacos are on point. My favourite still goes to the bulgogi beef. 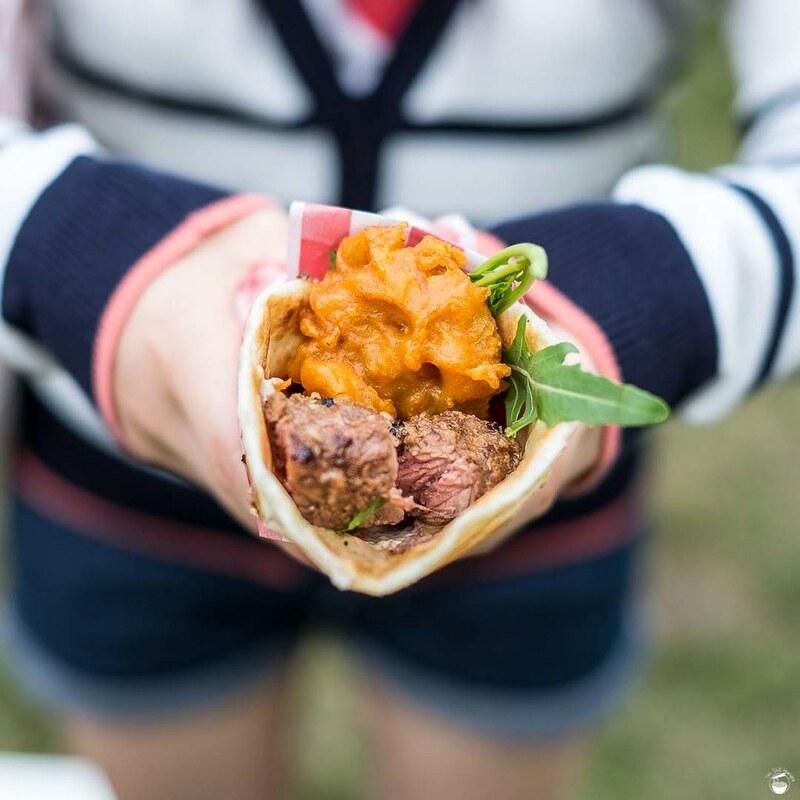 Juicy, sweet sauce-marinated beef coupled with spicy mayo and spicy kimchi is a hard combination to top. The chicken is also quite nice, but relative to the exciting beef? It doesn’t stand a chance. One downside about Poklol’s tacos is that they’re really juicy. Chances are, you won’t be able to eat them without some spillage, especially the beef taco. Prepare yourself for this – lest you intend to give your pants a saucy paint job! Remember Mr Bao? They’re great, but it’s abao-t time someone brings on some competition. That’s where Bao Stop comes in – another gua bao vendor on the other side of the markets. 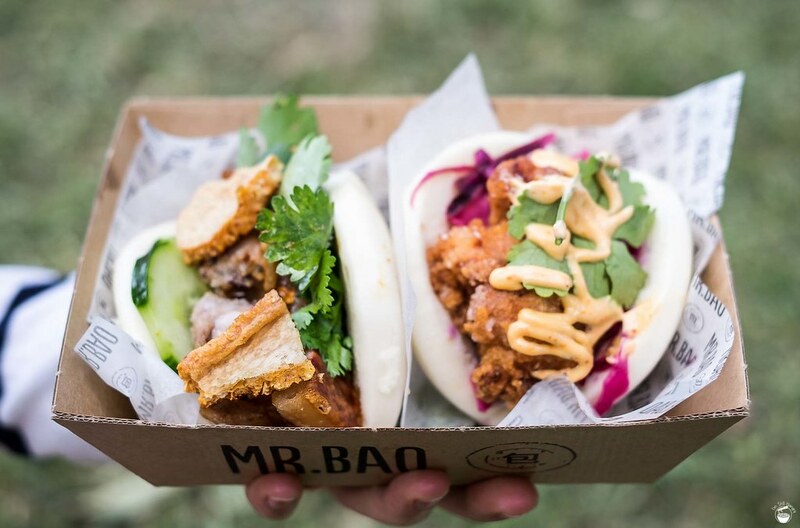 I suppose the trek to the other side of Hyde Park is so arduous, you just might want a second bao fix by the time you make it there. If that’s your reason, I forgive you. Because both bao stalls are delicious. Whoops, I forgot to take a picture of the Bao Stop stall. It’s directly to the right of the Miss Dippity’s stall! But Bao Stop has one up on its gentlemanly companion – the existence of a Peking duck filling. To add insult, Bao Stop sports killer fries known as Peking duck fries. Yes, that is exactly what it sounds like. Boom, the heat’s on now, because Bao Stop’s in the lead. Let’s check it out. 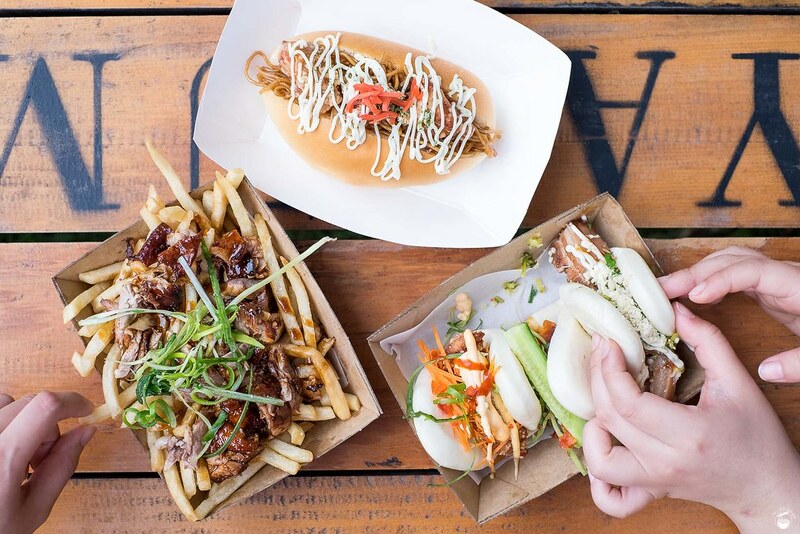 Bao Stop will stop you in your tracks, because these are seriously delectable hits of flavour you don’t want to miss. Fluffy & warm white buns are the staple all around, and while they are smaller than Mr Bao, are completely on par with flavour and bouncy texture. I really enjoyed the pork belly filling in particular, as it’s all soft, chewy and flavoursome meat. Also kudos should be given to the Peking duck bao, as the hoisin sauce that’s included is all sorts of flavour that’s a delicious assault on the senses. Sweet, sour, savoury, ducky. I suspect the Peking duck bao will be the favourite of many. You know the bao is good when fried chicken bao is actually the least interesting pick, but that’s not to say it’s bad – it’s just overshadowed by its very well-executed porcine & winged brethren. You know where I’m getting at, right? GET ALL THREE. 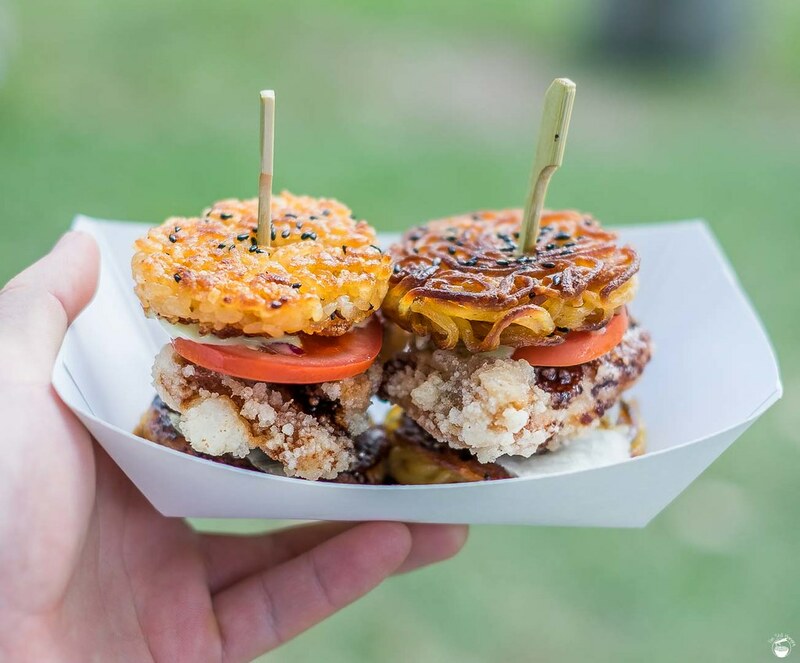 Balanced-view disclaimer – while the pork belly seen in the picture above looks to be an incredibly generous slab, a friend who ordered the pork belly bao that same day got a much smaller piece, fitting easily within the folds of one bao. I’m not a fan of inconsistency, so keep note! But, but, I didn’t even talk about those Peking duck fries! Yeah let’s do that, or let’s not – because I’m too busy eating them. Seriously, they’re really good – if you’re into Peking duck and Peking duck sauce. Imagine that stuff slathered all over your piping hot fries. It’s gorgeous. I’ll just say that this dish should be shared, because it’s a fair bit fatty and the portion size is generous. If Peking duck fries aren’t your thing (is that possible? 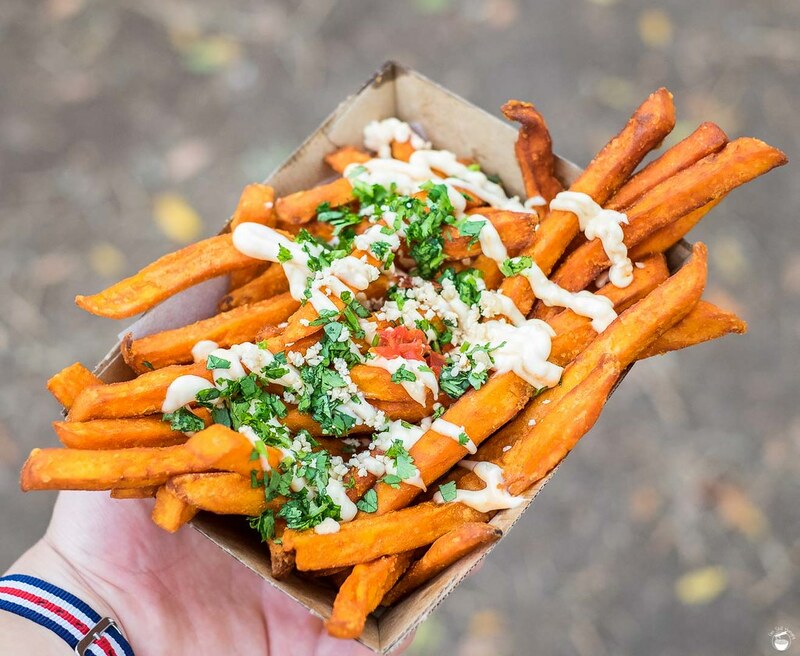 ), then Bao Stop has one last ace up its sleeve – sweet potato fries. As a bonus, these are vegetarian-friendly, so really, you’re running out of excuses. Why would you even need one? These sweet potato fries are the best sweet potato fries of the markets – and I’m not just saying that because they’re the only ones :P. They’re fluffy on the inside, crunchy on the outside, and of course – taste like sweet potato as well. I almost didn’t need the mayo, the chips carry enough flavour by themselves. That said, I appreciate how the mayo addresses a bit of dryness in the chips. For only $8, these are a steal for Night Noodle Markets standards. 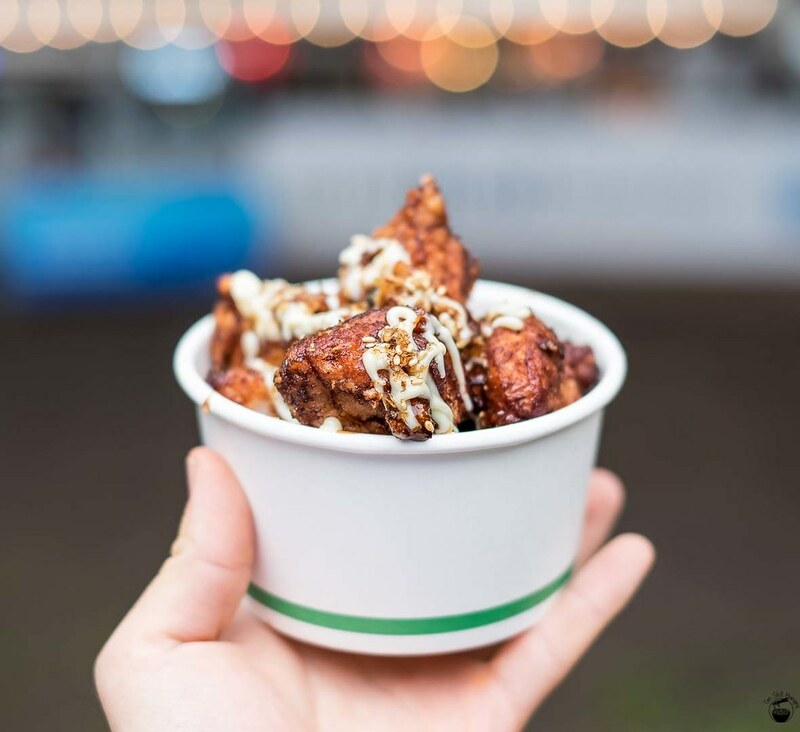 For those who might want to be more protein-focused, Bao Stop won’t disappoint – why not give the XO fried chicken a go? I had an entire box of this to myself on Monday, and I regret none of it. 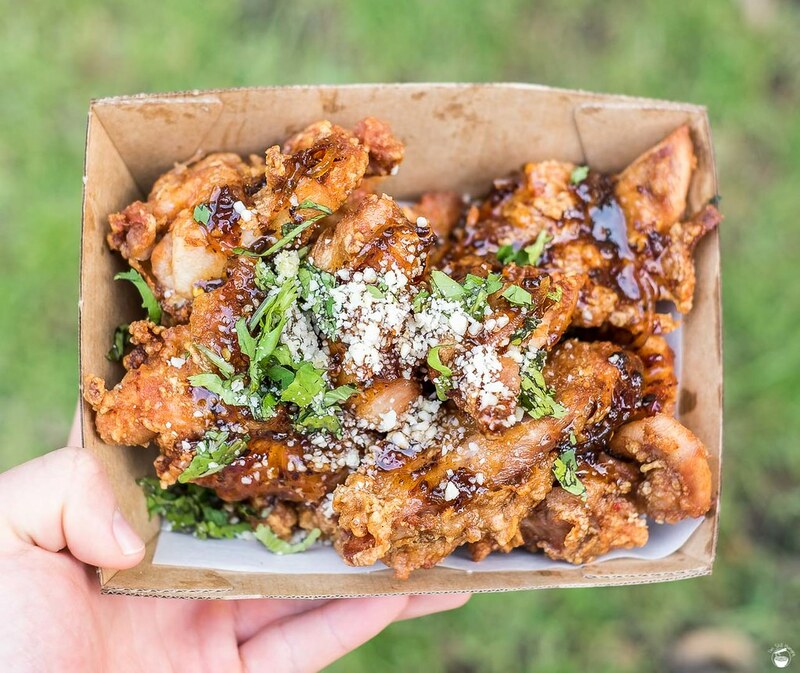 Huge (and I mean seriously big) chunks of chicken are deep fried and dressed with glazy, sweet & saucy XO, without removing the crunch of the chicken skin but delivering 100% on the flavour. Similar to the Peking duck fries, this should be shared, but like I demonstrated – nothing wrong with indulging in yourself every now and then, right? 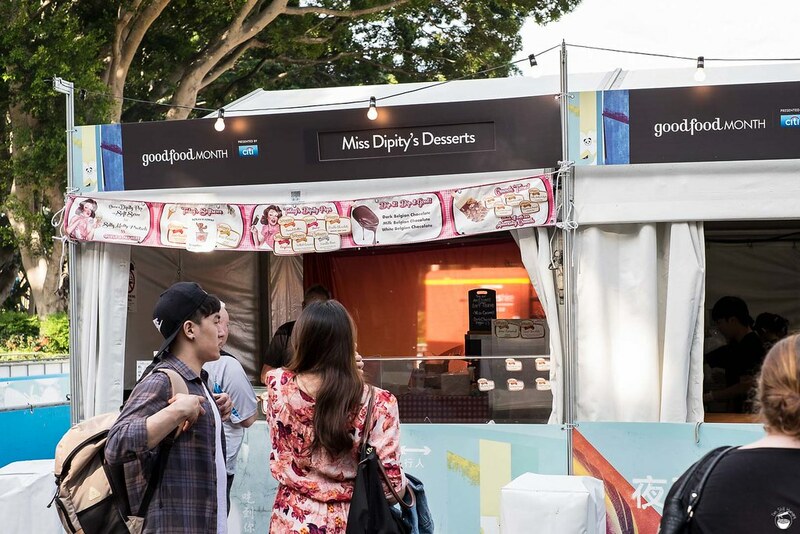 For an unspecified limited time only, Bao Stop and Miss Dippity’s, due to their proximity to each other, are doing a collaboration dessert – the miso caramel soft serve bao. 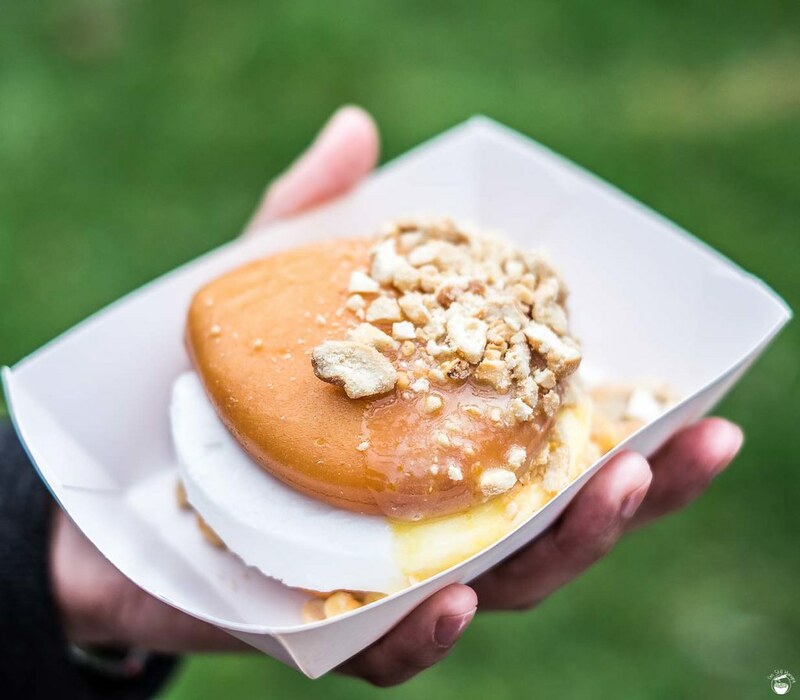 This is exactly what it looks like – Bao Stop’s gua bao given the deep-fry treatment, topped with a most charitable serving of miso caramel gelato, chocolate sauce, and nut crumble. Let’s just say that this dessert combination gives Messina’s dessert bao a run for their money. The bao is crunchy but not heavy, and still fluffy on the inside. The soft serve is creamy, full of caramel, and a tinge of savoury miso in aftertaste that prevents the whole thing from becoming too sweet. The addition of chocolate & nuts are bonuses that are always enjoyed. Bring it on, folks – bring it on! 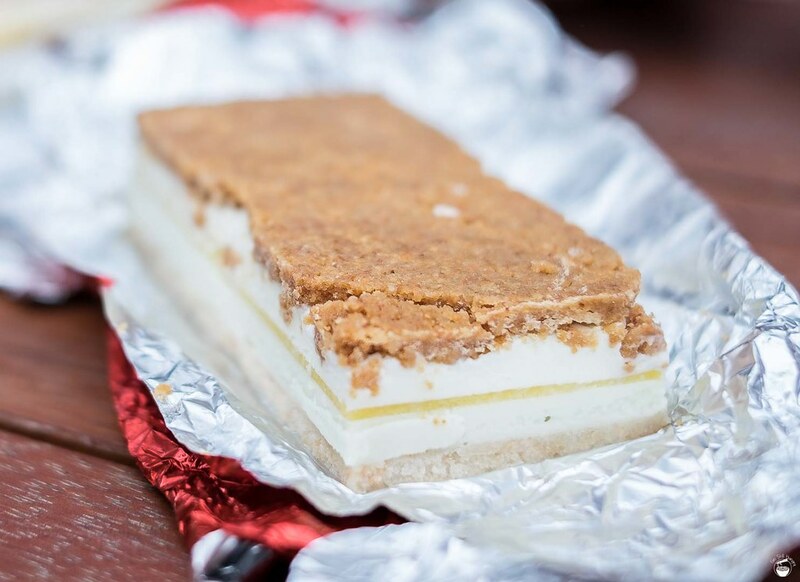 It was a given – nay – it was DESTINY that would eventually see myself visiting the Black Star Pastry x N2 Extreme Gelato stall. My only surprise is that I didn’t do it sooner. Thing is, with two iconic names teaming up like this, it would be selfish not to share the love. 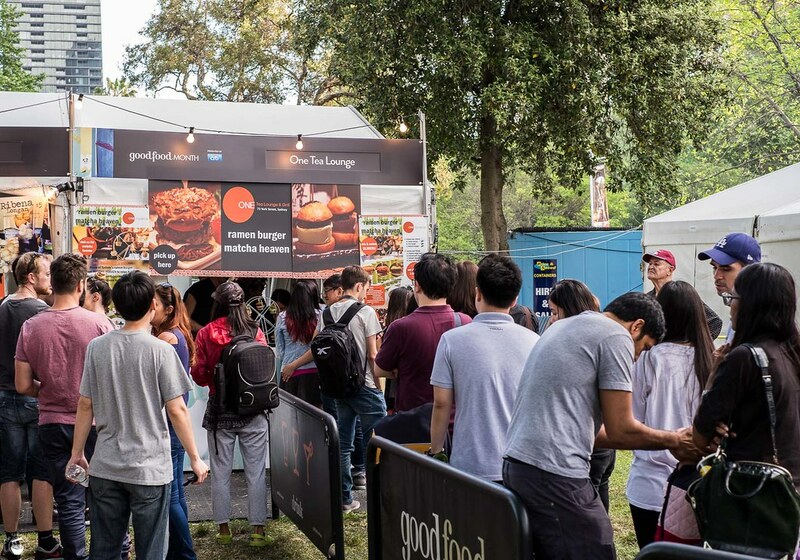 Plus, given that the queues build up before the Night Noodle Markets even open, it’s not too far of a stretch to say that it’s a challenge just getting yourself a slice of the action. Get your gelato/cake/ramen right here! We got there a few minutes before opening time. Sure, we waited for them to actually start service, but when they do it’s very quick and efficient – a docket is served pretty much every 20 seconds or so. Don’t be put off by the line – it moves faster than you’d think! The combo, from left to right: (1) Brokeback Moment – vanilla gelato w/honeycomb, choc-topped & salted caramel sauce -$8. (2) Teafogato – strawberry watermelon cake smashed with N2 gelato & hibiscus rooibos tea & freeze-dried cherries – $8. 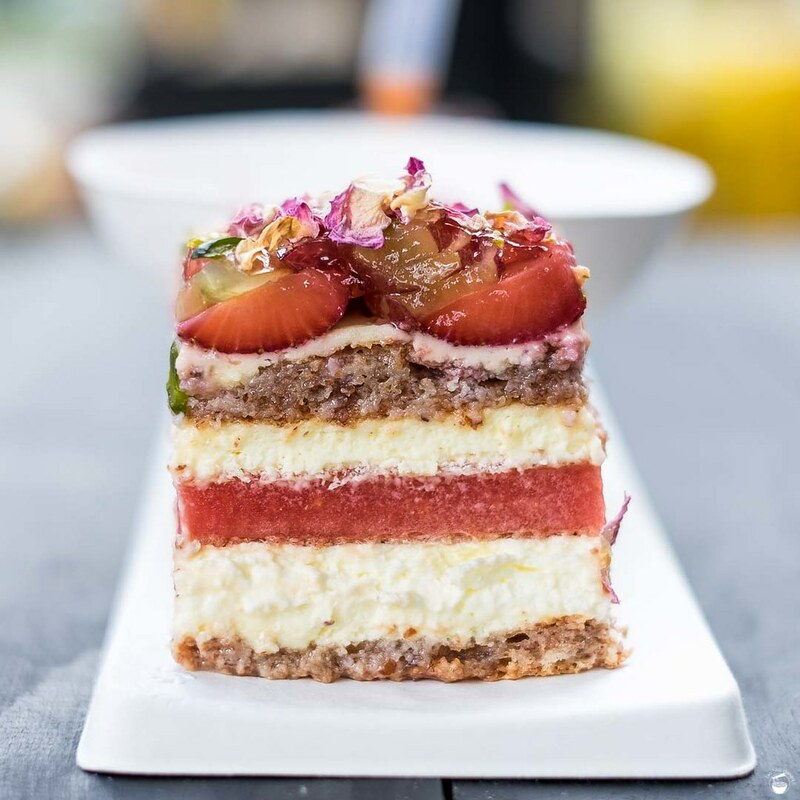 (3) Strawberry watermelon cake – the one and only – $10. BSPxN2 serve three separate desserts, or you can do it right (also known as the I’m Still Hungry way) and just get all three as a combo for $25. On the left, it’s a pure N2 creation. On the right, Black Star’s 100% original, one-and-only cake. The middle is where things get funky – it’s what you get if you put the cake and the gelato in a room, turn off the lights and walk away. When in doubt, get it all! Let’s start with the lovechild of BSPxN2 – the teafogato. 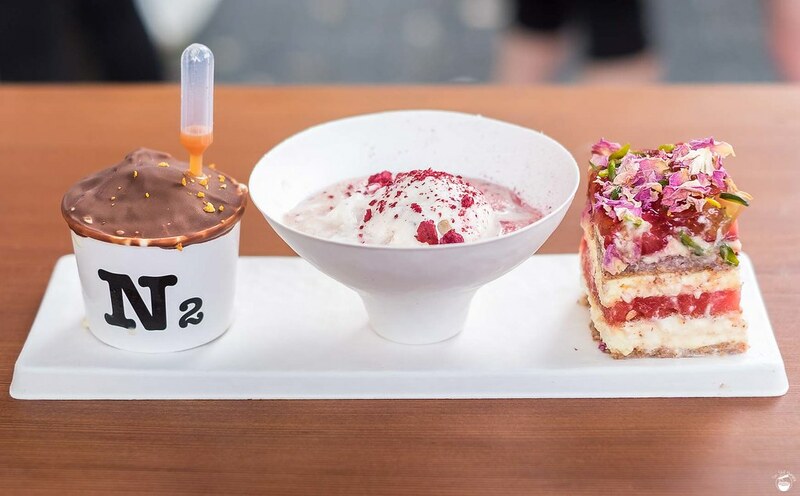 This is definitely the strangest dessert of the three – and it really is a combination of Black Star’s strawberry watermelon cake and N2’s nitrogen gelato. The teafogato is actually still smoking with liquid nitrogen when it arrives, though that dissipates very quickly (hence no photo). In terms of taste, it’s essentially a scoop of tea-infused vanilla gelato in a pool of rosewater, cake bits and crunchy freeze-dried cherries. 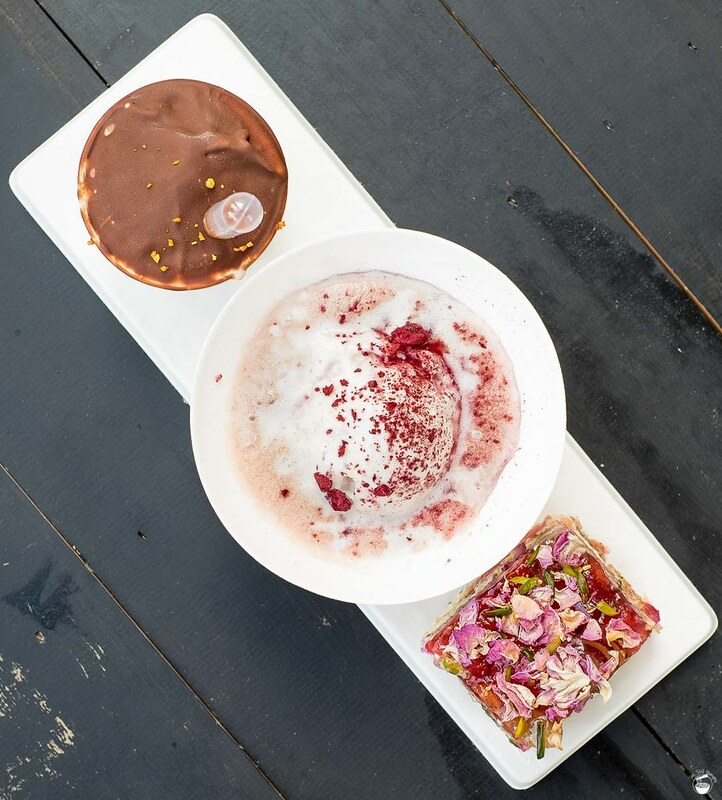 The aroma of rosewater is strong, courtesy of the BSP heritage, while the gelato is smooth and creamy – thanks to N2’s flash gelato-making process. Some people have commented that the teafogato almost tastes like soap, and I have to say while I didn’t think this to be the case when eating the dessert, it’s definitely more “soapy” when drinking it. 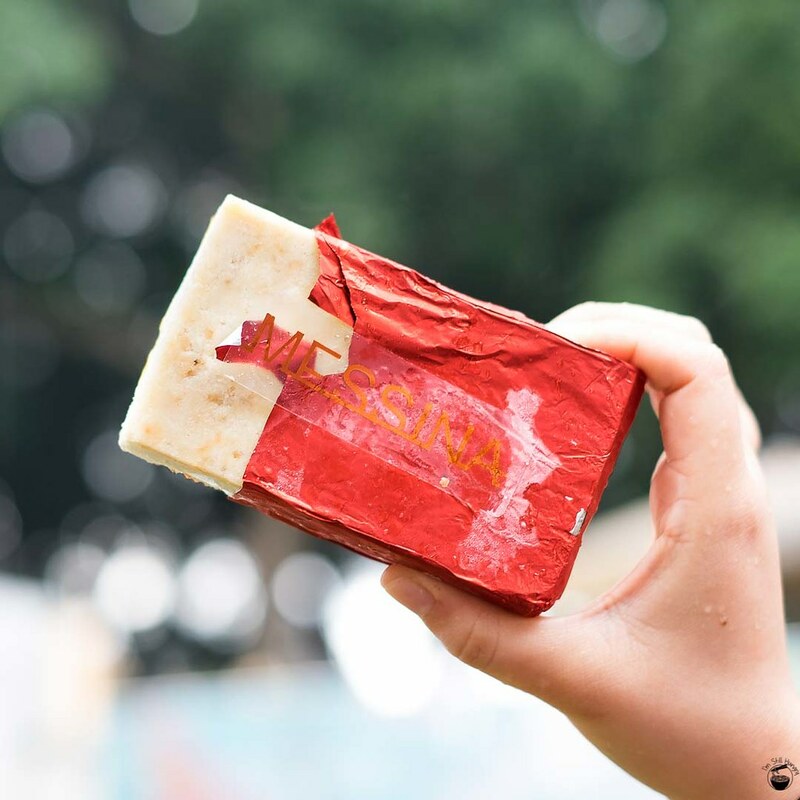 Best to not let this one melt – take your photos quickly! 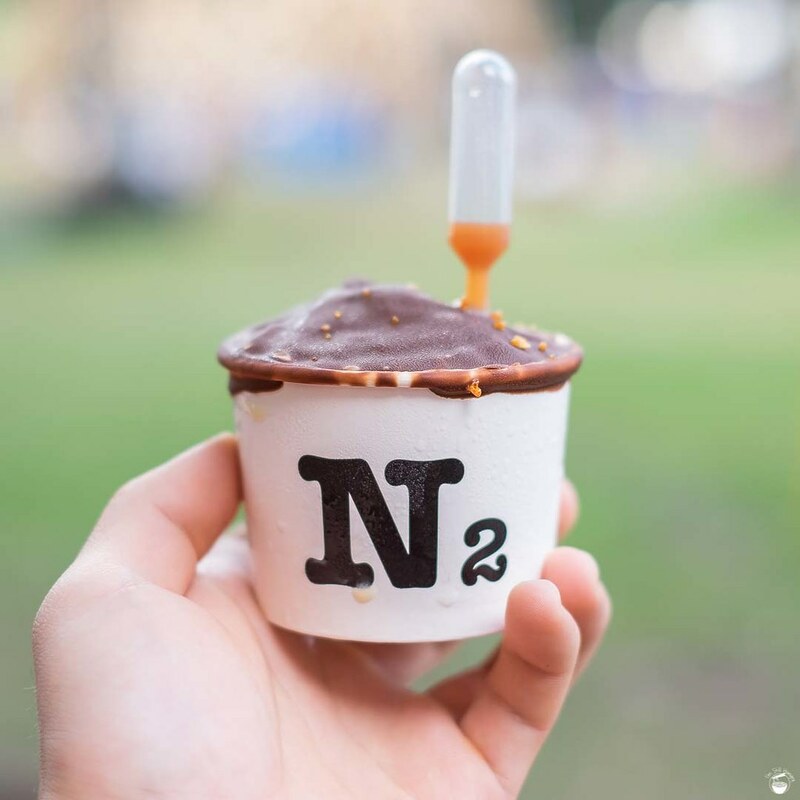 Why not give N2’s classic vanilla gelato a try? It’s delicious, especially for what is supposedly just a vanilla gelato. That N2’s texture is just fantastically creamy is a bonus. The pipette of salted caramel sauce adds an extra burnt sugariness to it that I’ve never found to be unwelcome – it’s just a nice gelato which should amply satisfy a sweet craving in these crowded markets. Not a must-order, but you could do much, much worse when it comes to the sweet stakes at NNM. As for Black Star’s strawberry & watermelon cake…need I say more? Don’t get me wrong, I don’t think it’s “the best cake I’ve ever had”, but it is a great slice nonetheless, and regardless of what this pleb thinks of it, it’s undeniable that its icon status is well and truly established in the Sydney foodie psyche. For that reason alone, it is worth trying if you’ve never had it. Heck, still a pretty darn good cake – I’m glad I had it again, as it’s been over a year since my last time. Welcome back to my stomach – and to yours too, hopefully! Being right next to Black Star x N2, Ramen Zundo gets to bask in a huge amount of “in-line” publicity as queue-mongers wait their gelato/strawberry watermelon cake. 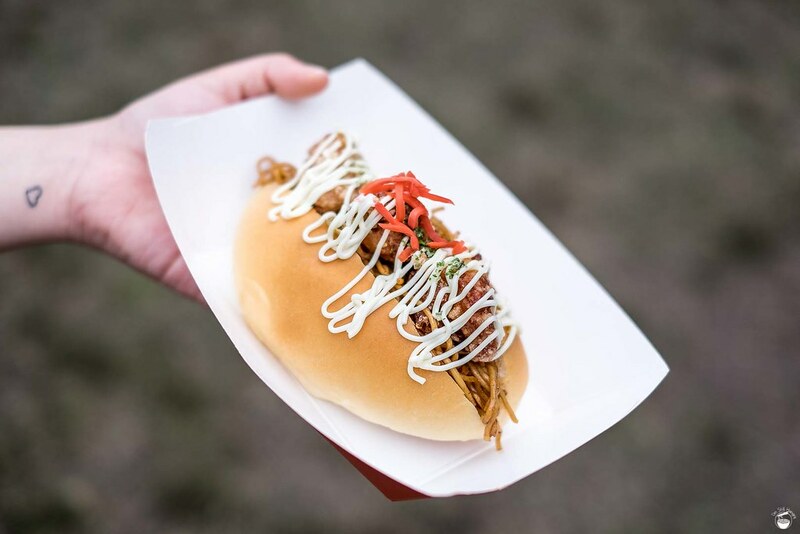 To this end, their special contribution to the Night Noodle Markets (other than a standard menu of stir-fried ramen, karaage chicken & tofu) is the ramen roll. With the advent of ramen burgers and ramen tacos, is anyone actually serving normal ramen these days? Apparently not so at the Night Noodle Markets, that’s for sure! To Ramen Zundo’s credit, they are trying to be different, and a hot dog isn’t too bad of a place to start. Unfortunately, the problem with doing a ramen roll is that it’s carbs encasing carbs – it doesn’t work all that well. The bread’s fluffiness gets caught up in the ramen noodles, and without a whole lot of protein to back it up (there are literally only three medium-sized pieces of karaage chicken in the entire roll), the texture balance is all off. Not even drizzles of mayo can save it. I’d give this one a pass, there are plenty of other things to eat. Shame, as Ramen Zundo’s restaurant actually serves incredibly tasty ramen. Back to their restaurant then! It only took three visits, but I finally managed to visit a stall that’s been on my hit list since the beginning – Devon Cafe. 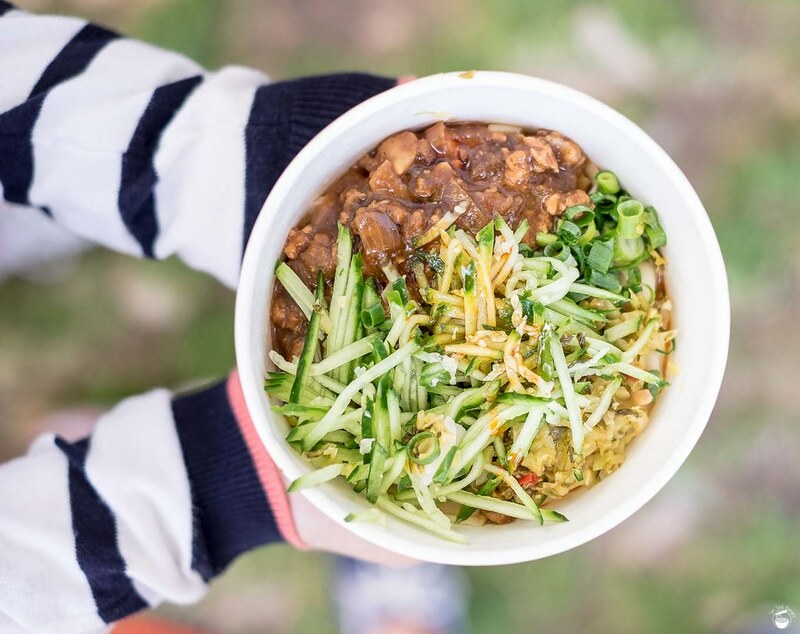 I’m no stranger to Zacharay Tan’s Asian-inspired creations, having visited the Surry Hills & Waterloo locations more than I care to count. Only natural then to check out their Night Noodle Markets stall, no? This is full on, and proves that Devon isn’t just another café that’s trying to put an Asian spin on its food. Rather, it’s the other way around! 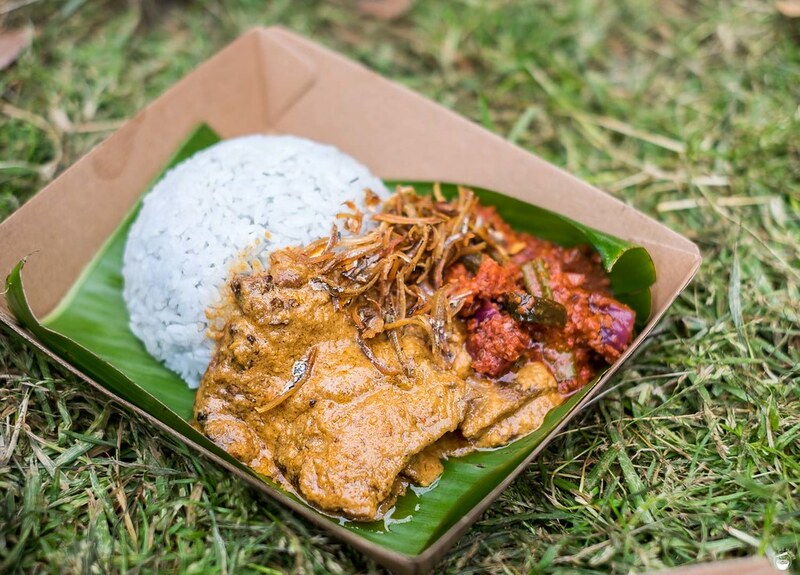 A rather unique aspect of Devon’s Nasi Lemak is the blue pea flower jasmine rice – it is indeed a subtle blue colour, more for looks than for taste. That said, it’s a well-cooked rice, and serves to soak up the fragrant curry in delicious fashion. 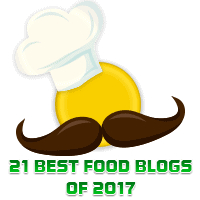 The standout components for me were the anchovies – a delectable crunch, as well as the pickled vegetables – yes once again, that crunch. Really though, the whole dish is quite nice, and I’d be happy eating this as a standalone meal anywhere else. 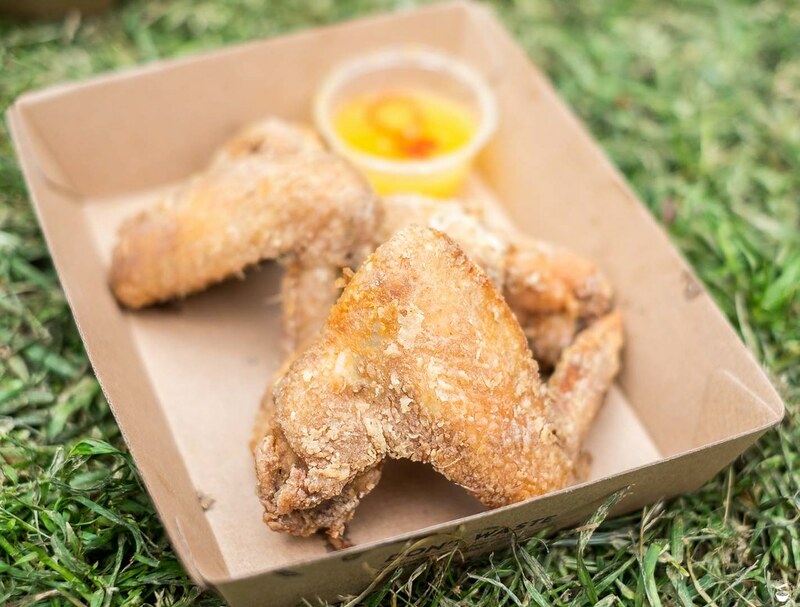 Chicken wings, when made well, are always a crowd favourite. Devon’s Crispy Belacan-style chicken wings twist things up a little with a prawn-based flavouring, which I quite enjoyed and is definitely a far cry from most other fried chicken recipes out there. The meat is juicy (score! This is so rare), and the skin a peculiar kind of crispy that is somehow still gelatinously chewy. I can’t say it’s my preferred way to eat skin (super crunchy is still where it’s at), but again, these wings are all about flying you to somewhere different. Like the nasi lemak, also worth getting! One of Devon’s stalwart pastries is their cronuts – err – I mean cronnies (them trademarks tut tut). 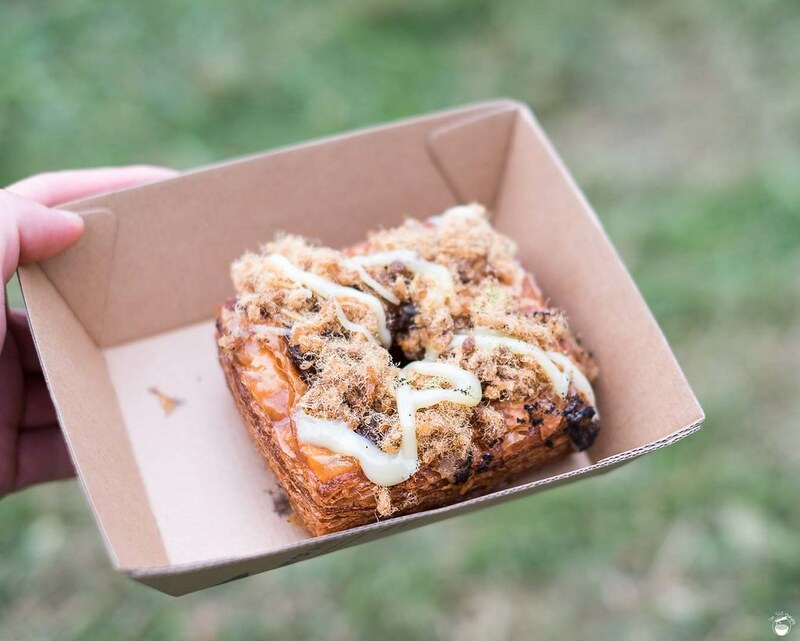 I’m personally not a fan of them as they are bursting with oil in every bite, and the pork floss cronut is no exception. Pure, unadulterated slick, which I may have withstood five years ago, but now is actually a little sickening. I’m sorry Devon, it’s just not my style – one cronut is over 800 calories, and yes I’m going to go there – this isn’t worth them. The flavour is also very salty, but to its credit – definitely tastes of savoury pork floss. If it weren’t for the oil, I’d have enjoyed it far, far more. 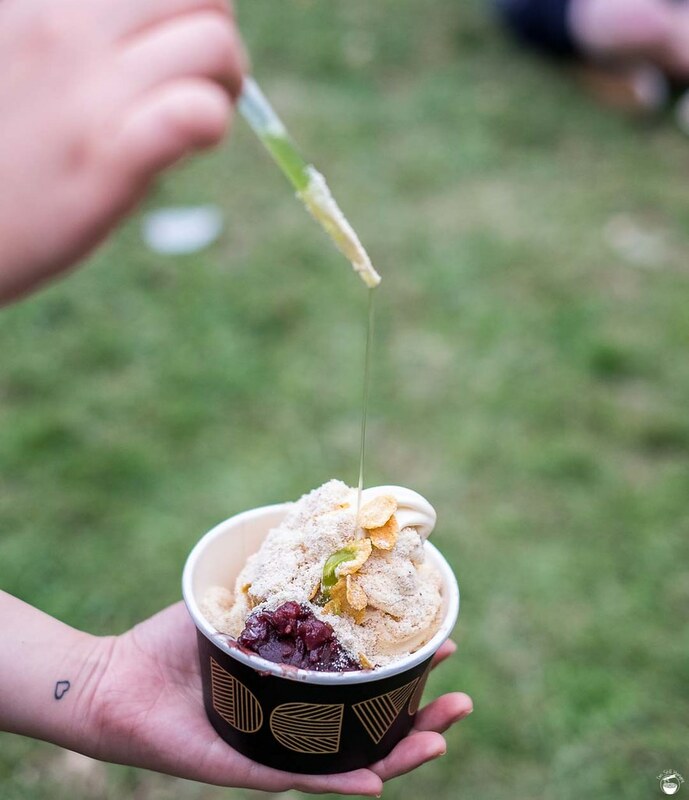 If the cronnies are a segue into oily oblivion, their miso & sweetcorn soft serve is what truly makes miso happy. This is a fantastic sundae, and having tried multiple previous flavours at the Danks location, I can say it’s one of the best they’ve ever made. None of us could readily taste the miso in the soft serve (it’s reallll subtle), but the corn was evident – a sweet, savoury-tinged vegetal flavour that pairs well with the creaminess of the soft serve. Oh yes, that stuff is creamy, and we love it for that fact. For once, something green that isn’t matcha! Additional texture is added in the form of burnt butter popcorn and of course – you saw this coming – corn flakes. The crunchiness these elements add is most welcome. Further, as any lover of adzuki (red bean) will tell you, it pretty much goes with any dessert, so bring it on! The only element I wasn’t sure of was the lime & coriander syrup. I didn’t really get to have much of it, but I wonder about the reason behind this particular matching. But you know what? That doesn’t matter. 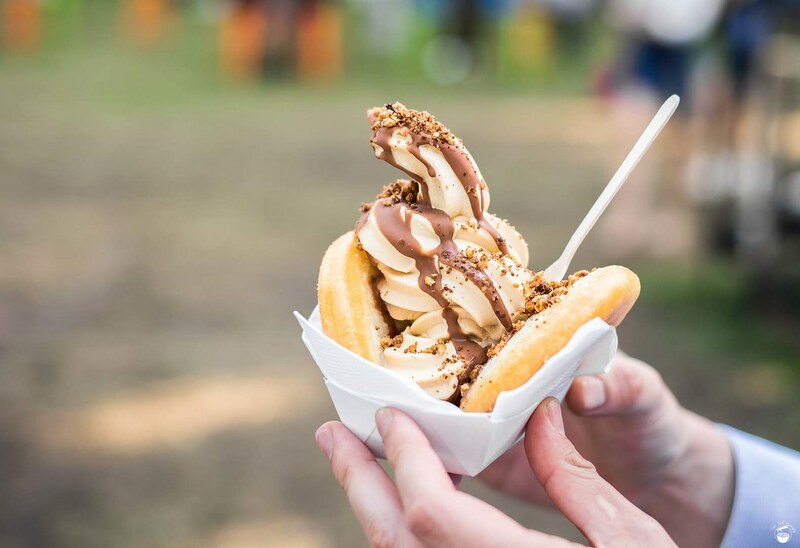 This soft serve is legit, and probably one of the best desserts at the Night Noodle Markets. Make sure to order it as a sundae and not a soft serve if you want all the extra trimmings. 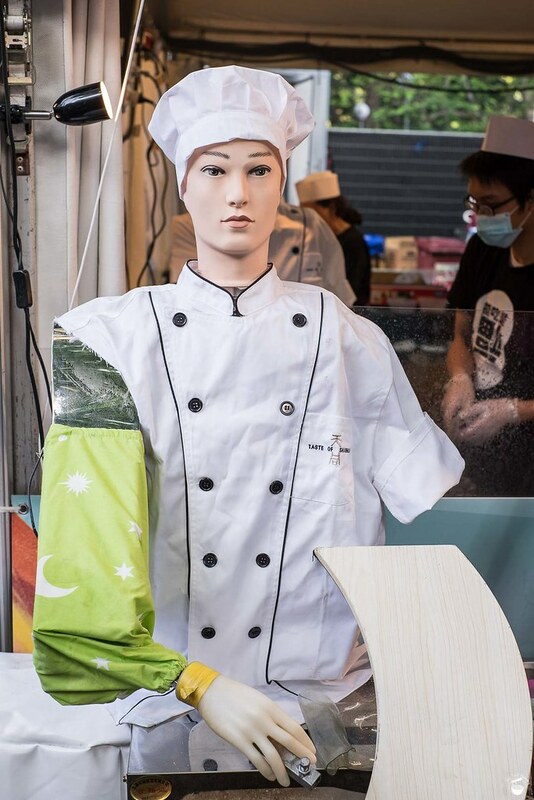 Ever wanted a robot make your noodles for you? No? Well too bad – they’re the future, and Mrs. Mi is leading the charge. Sorry for the closeup – I couldn’t stand back far enough! This Northern Chinese-style stall serves up various Chinese dishes such as dumplings, Taiwanese-style fried chicken, shallot pancakes, and a signature noodle dish known as 刀削面 (dao xiao mian) – literally translated as “knife cut/shaved noodles”. Traditionally, this is done by hand, and the better the chef is at doing this, the tastier the end result. Skill makes a huge difference. Thing is, what’s it like when your chef looks like this? Oh, I guess it doesn’t have legs. Or a soul, I suppose. But one thing these robots supposedly do well, and with incredible speed is shaving noodles in a remarkably consistent fashion. 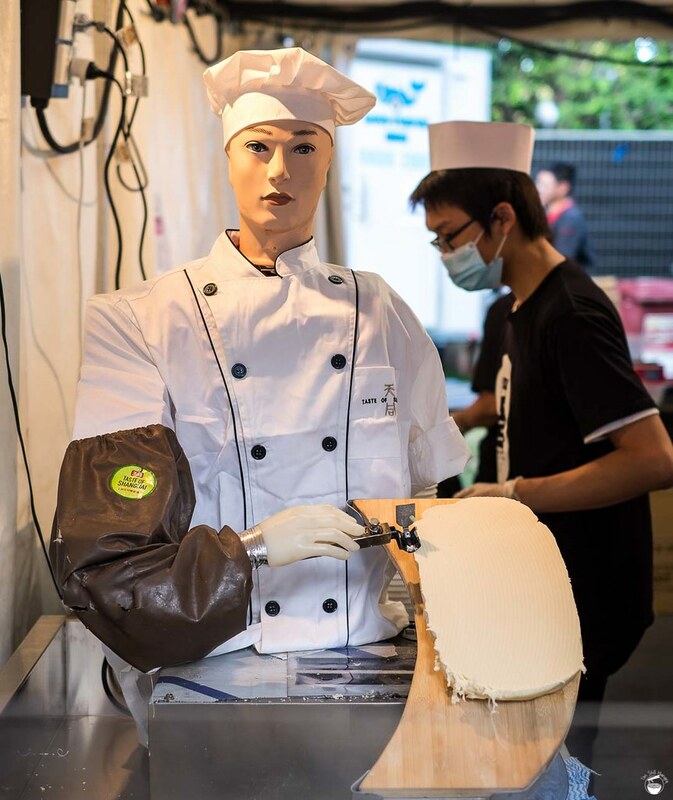 Unfortunately, in my time at the stall, I never did get to see it in action, but these robots can process hundreds of kilos of dough into noodles in a mere fraction of the time humans can – you’d expect then that the service would be very quick. And yes, you would be right. I got a steaming bowl of noodles in less than two minutes of waiting, and that’s with 4-5 orders in front of me. The only real amount of time required is actually cooking the noodles – a process that can’t be expedited with a pair of mechanical hands. Thing is, the devil’s in the details – and the details are all in taste. Let’s taste. Mrs. Mi’s 刀削面 comes in the form of 炸酱面 which is a Shandong-province specialty. The key feature is the aforementioned knife-cut noodles, along with a braised pork mince sauce which one could describe as an Asian beef bolognese sauce (spiciness optional). Often, the dish comes topped with julienned cucumber and pickled vegetables. It’s meant to be fragrant, it’s porky and it’s tasty. 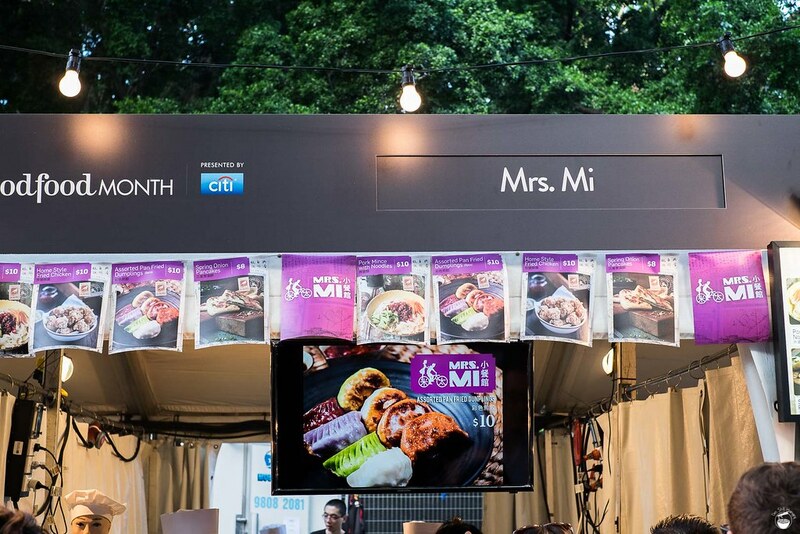 I feel that Mrs. Mi could have been a little more generous with the 炸酱 – the pork mince sauce. This is what brings 95% of the flavour, so it’s critical that there needs to be enough of the stuff. While there was a fair bit, the sheer volume of noodles we got (this was a heavy bowl) meant that more mince sauce could have been included. But the key test – how are the noodles? Unfortunately, they’re quite doughy and chewy. I prefer my noodles a bit more clearly-defined in terms of texture, and Mrs. Mi’s felt like they might have been overcooked to the point where the gluten was breaking down, or the dough rose/developed too much in the rising phase. In either case, the robots did their job – they sure are consistent. More meat sauce and slightly more defined noodles would make this a killer dish. It’s still worth a try, but hopefully you can share it between 3-4 people. It’s a fairly hefty portion, and loading up on this much carbs is not a smart move for the Noodle Markets. But hey, I had noodles at the noodle markets! How about that? 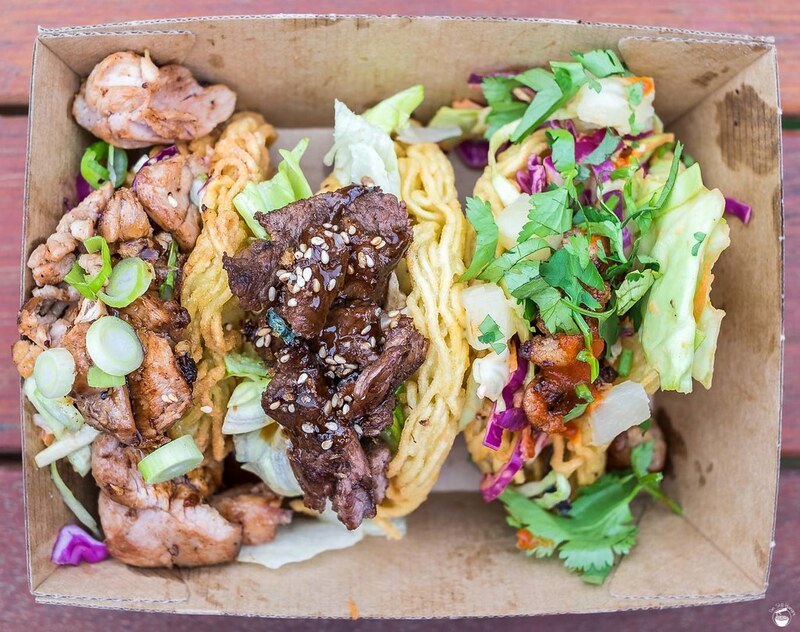 There’s never a shortage of bao stalls at the Night Noodle Markets, and that’s a good thing – they always get the longest queues. Case in point: the line for Mr Bao makes an Anaconda jelly. It stretches out all the way to the road, and then some! On the plus side, the wait isn’t as scary as it looks, as service is mostly efficient – no supply issues here, just bao bao bao bao bao. Speaking of bao, Mr Bao does it two ways – one is the traditional char siu bao which I’m sure we’re all familiar with. 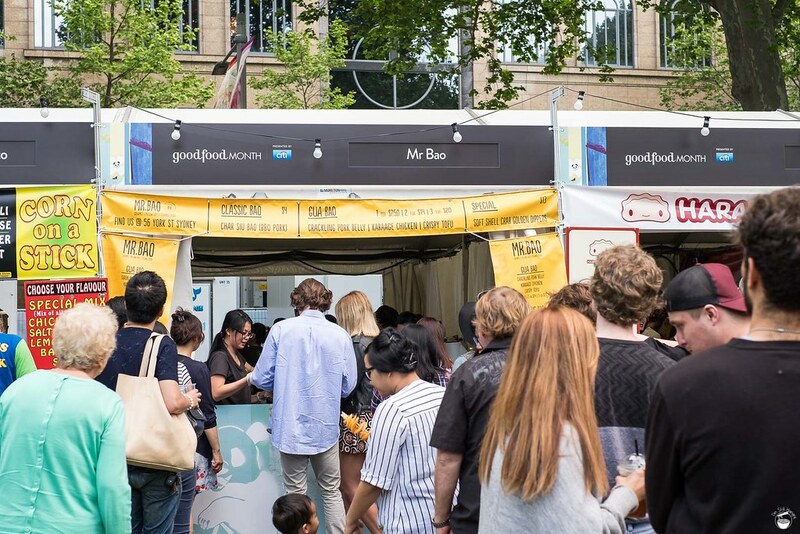 The other kind is gua bao, which has made a bit of a splash in 2015 with places like Belly Bao, Bao Stop, Ippudo (oh yes they’ve got those) and Melbourne’s Wonderbao all making their mark. And why not? Gua bao are deliciously fluffy little numbers that enclose any number of delicious fillings – most commonly pork (belly), fried/braised chicken and tofu for the vegetarians. Heck Bao Stop (update incoming) even does a peking duck bao, which in hindsight makes TOTAL sense. We ended up ordering the crackling pork belly and fried chicken bao. They come in threes for $20, or $7.5 each. I like tofu, but I also like variety, so it was skipped this time around (I’m sorry my stomach isn’t like Doraemon’s). No regrets – the fried chicken bao is where it’s at anyway. Crunchy and juicy fried chicken, a devilishly addictive, creamy mayo on top of a pillowy bun makes for a very strong choice of snack. The slaw is also quite nice as it adds a sour, pickled crunch which foils the richness of the chicken & mayo. I was less a fan of the crackling pork belly bao. While crackling is usually a winner, the pork belly itself didn’t carry too much flavour to it. It was a few bites later when I realised that 99% of the flavour was concentrated into a sweet & sour sauce at the bottom of the bao, which meant a very inconsistent experience. Dang, this could have been great! The result? Winner winner – chicken dinner! 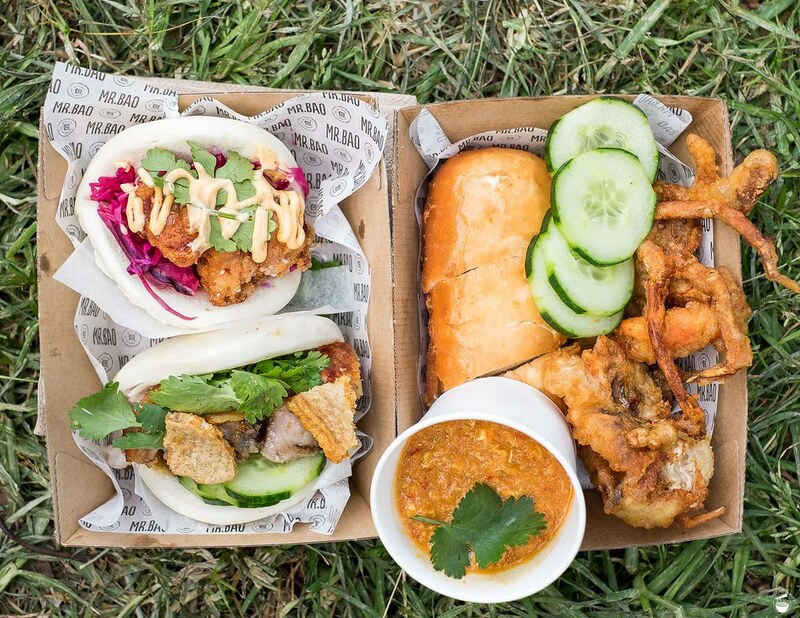 For those who want a different kind of bao, Mr Bao also does soft shell crab dippers, which is exactly what it looks like – crispy soft shell crab, deep fried dipping mantou bao, and a crab sambal. This is reminiscent of Yang’s Food Truck, but if we’re going to compare, Mr Bao’s is nowhere near as good. The problem is two-fold. One, the soft shell crab is really oily. It oozes the stuff with every bite, oh dear. Two: I had expected the sambal sauce to be a chilli sambal, but unfortunately it was very plain, though still carried some flavour. However, the deep-fried mantou is worthy of compliment – despite its name, it doesn’t taste heavy or too rich, and the insides are very fluffy, soft and have a nice sweetness to it, which meant I could almost eat it by itself. Very enjoyable! In the end? The gua bao is where it’s at, worth buying! 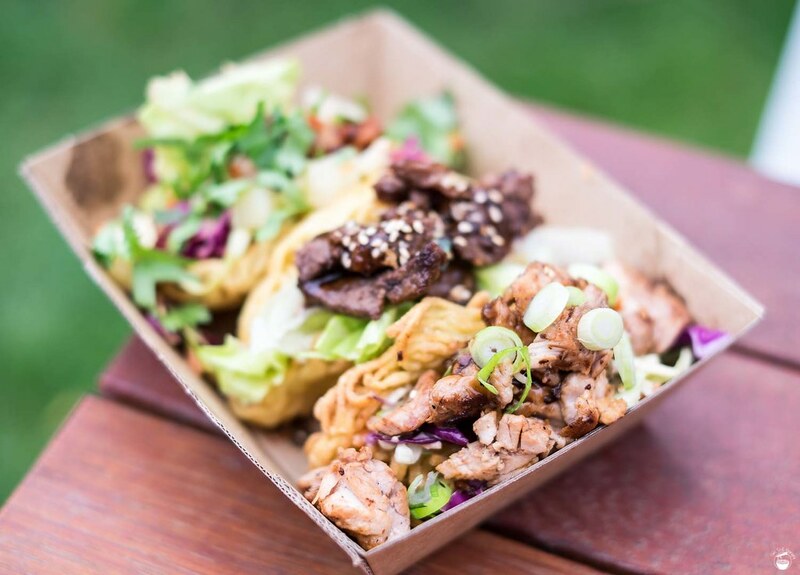 FYI: you can also visit Mr Bao’s physical restaurant on York Street – win! I’ve never had any Indian on any of my jaunts to the Night Noodle Markets, which is something I was determined to change this year. 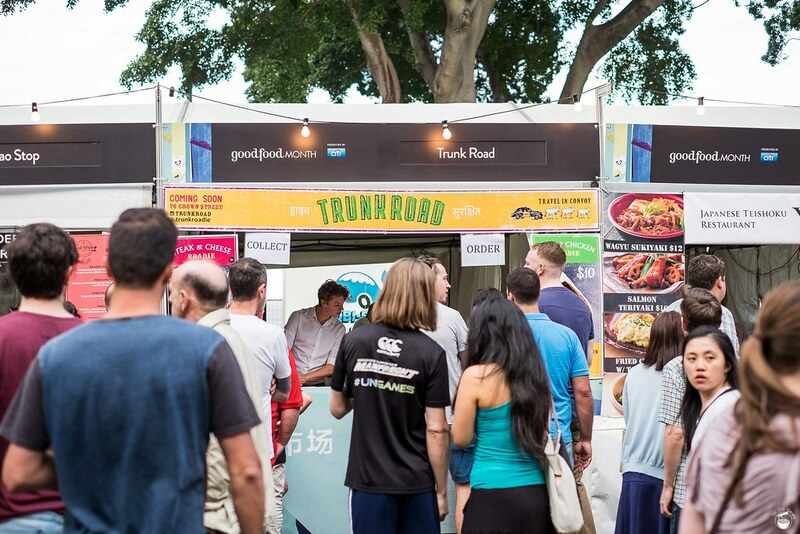 Enter Trunk Road, headed by the same folks behind Bang Street Food in Surry Hills. 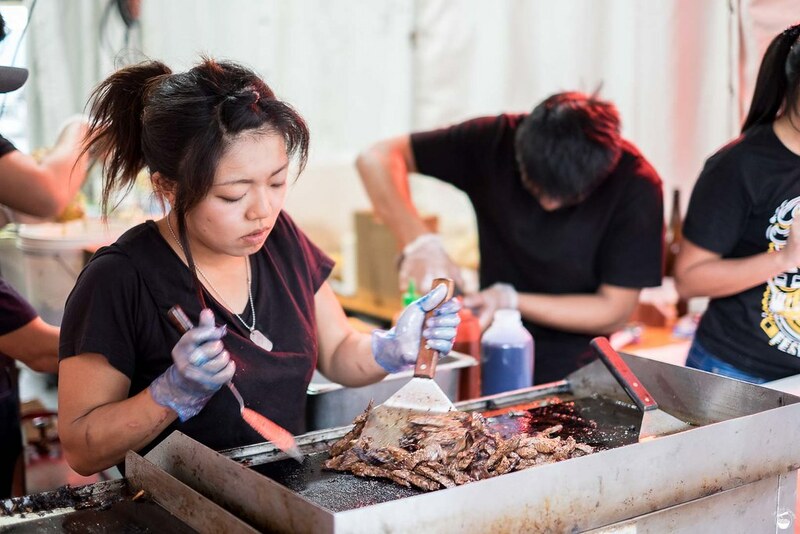 Their contribution to the Night Noodle Markets are the roadies. Essentially, fillings wrapped in a roti, served as a snack. Roti wraps, as it were. The two choices? Steak & cheese or butter chicken. As tempted as I was to get butter chicken, I felt like it was a bit of a safe option, so I turn Philly and get my cow on. 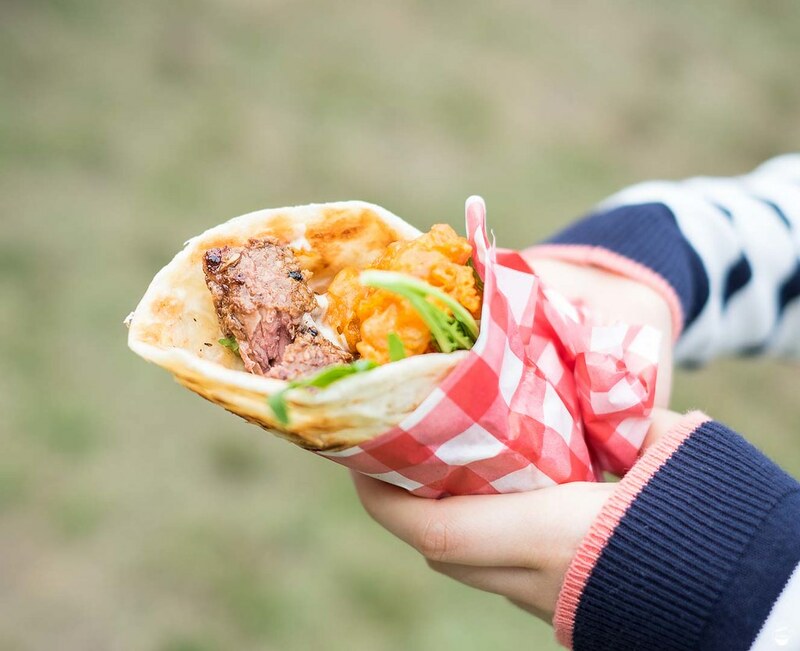 In the steak & cheese roadie, beef steak is cubed and served with onion bhaji (an Indian variation on onion rings that’s similar to an onion fritter), cheese sauce and wrapped in roti. Points awarded to the roti and the onion bhaji – soft, chewy bread that still carries with it a crispy and flakey crust, it was almost like a puff pastry that holds its form. Delicious. 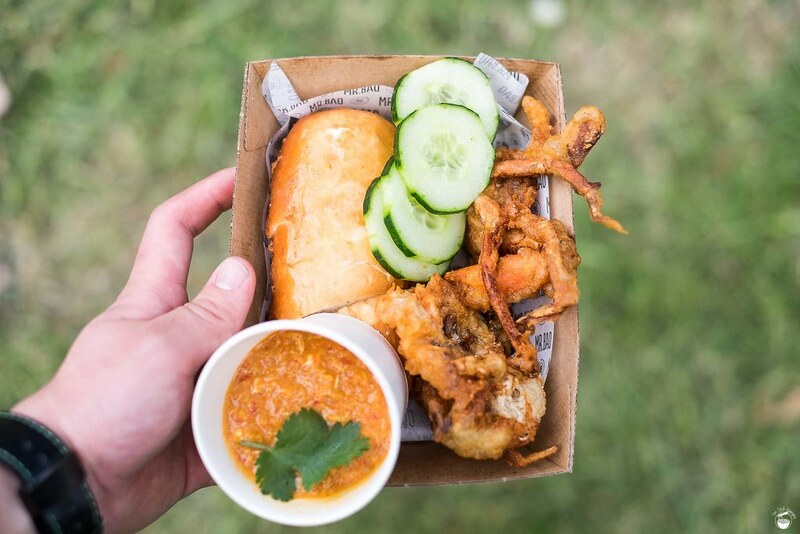 The onion bhaji was also a pleasant surprise – I really liked just how crumbly they were; they made sure the roadie never lacked any textural interest. As for the beef? I have to say they’re somewhat inconsistent. Some cubes are very tough and chewy, others less so. There could also have been more cheese sauce to provide flavour – the chunks of beef are cut quite large, so they’re not seasoned all the way through. More cheese would go a long way to address that. Still, given the strength of the roti and onion, I’d say this is worth trying, but perhaps give the butter chicken a go – that’s likely to be a crowd pleaser. Oh boy, this place. I’ve written plenty of words on David Yip’s infamous One Tea Lounge already, so I won’t go into the background here, when you can read it here instead. Suffice it to say that a Night Noodle Markets without One Tea Lounge is now impossible to fathom. This year, David introduces the matcha baoger alongside his iconic ramen & rice baogers. 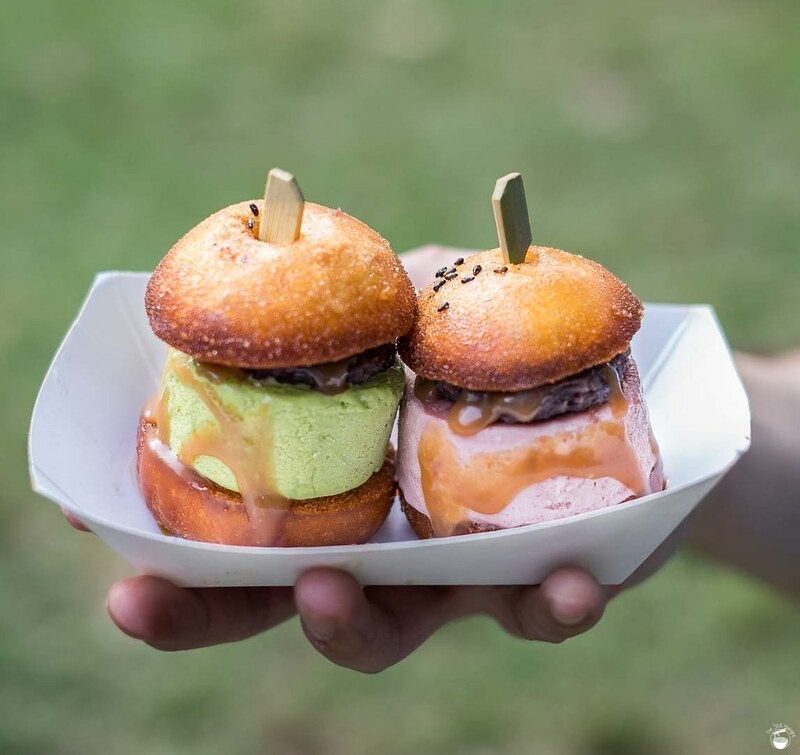 I don’t intend to get the matcha baoger at NNM, but I give the ramen/rice baogers another spin, as well as those oh-so-famous ice cream baogers. Of course, to even obtain access is a rite of passage in and of itself. I’d suggest queuing up the moment they open, or else be prepared to wait half your night at the place (but then again, any popular stall – e.g. Hoy Pinoy, has the same problem). 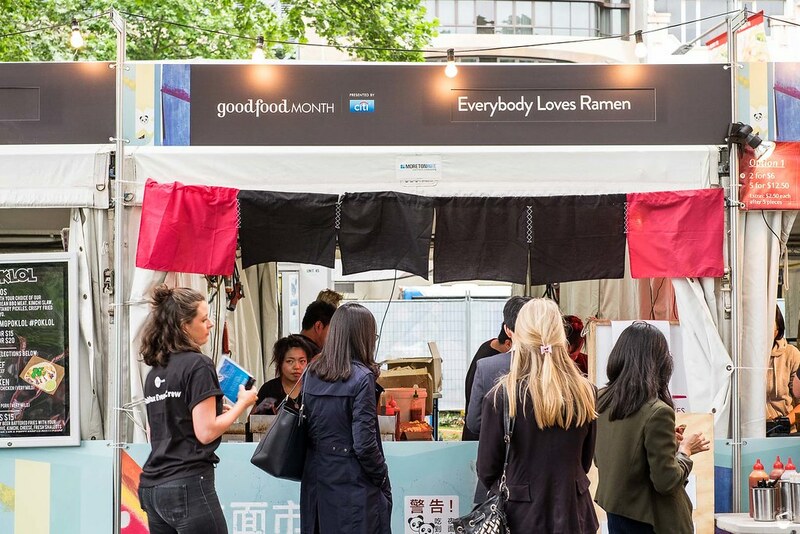 Still, queues and waiting are a part of life at the Noodle Markets, so be patient, and you shall be rewarded. David understands that One Tea Lounge won’t be your only destination in the markets, so in consideration of your stomach space, the baogers come in slider size. My filling of choice for both is teriyaki chicken (if you read my main post on One Tea Lounge, you’ll know why), and I’m very happy with both. Both the ramen and rice buns are well-built, hold together, and are full of crunchy texture. They’re freshly made to order, unlike the ramen tacos, the difference being readily apparent. The teriyaki chicken filling is also full of crispiness of its own, whilst the chicken is kept juicy within – no overcooked business here. The baogers are on a bed of sweet soy which while providing ample flavour, make the burgers a very messy eat. This is a multi-serviette job, unless you use knife and fork. Well, given the size of these things, you can try using knife and fork. Either way, just go for it. CRUNCH CRUNCH! 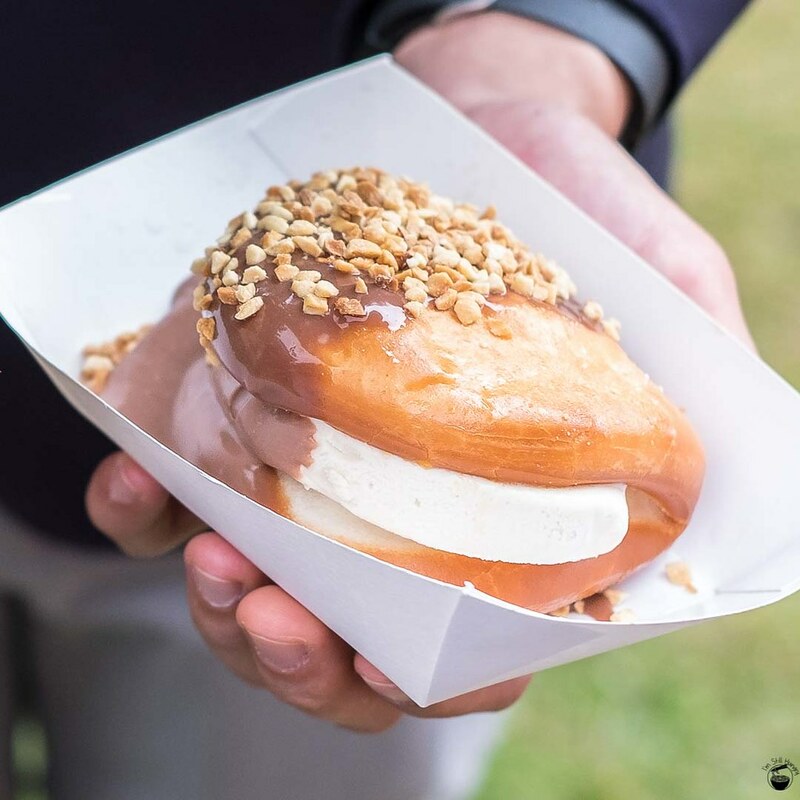 Naturally, a visit to One Tea isn’t complete without their signature ice cream baogers. With four flavours on offer, you’d imagine choosing only two of them would be a difficult job. Not so! Of the matcha, lychee, black sesame & red bean flavours, only the black sesame & red bean flavours are strongly representative of their named flavour. Why the matcha in the picture then? Not for me! The red bean? That hits the spot. 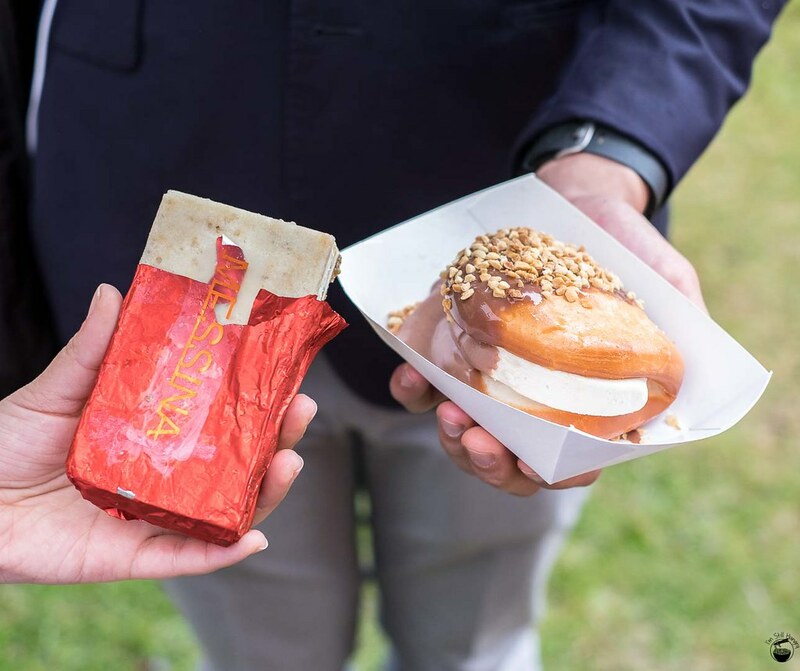 In an attempt to differentiate from the One Tea Lounge restaurant, David made a change to the ice cream baogers specifically sold for the Noodle Markets – the introduction of miso caramel. This is an instant flavour boost, and is well-received. This enhancement should definitely carry across to the ice cream baogers over at the main restaurant when the time is right. 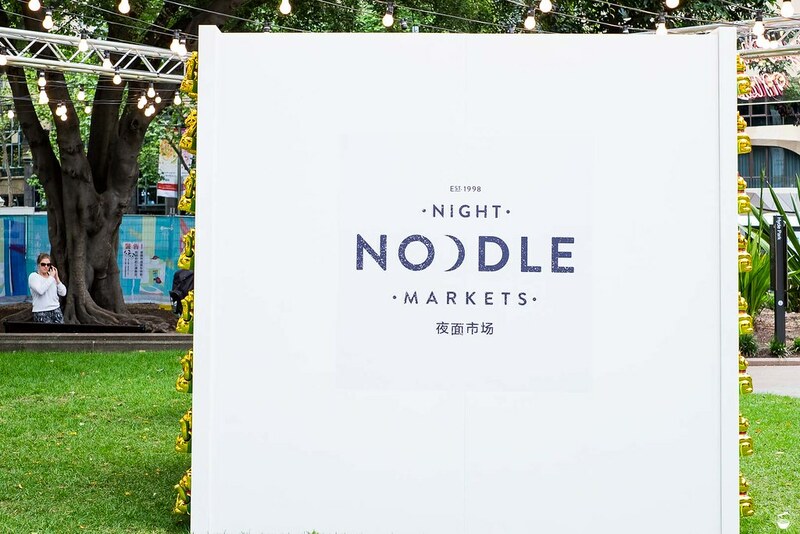 Now, you can’t really spell “Night Noodle Markets” without noodles, right? This year, I’m determined to put more noodle dishes in the spotlight, as last year I ate almost anything but noodles. Of course, I could get noodles anywhere – but as if our sensibilities couldn’t be astounded any further, I bring you ramen tacos. 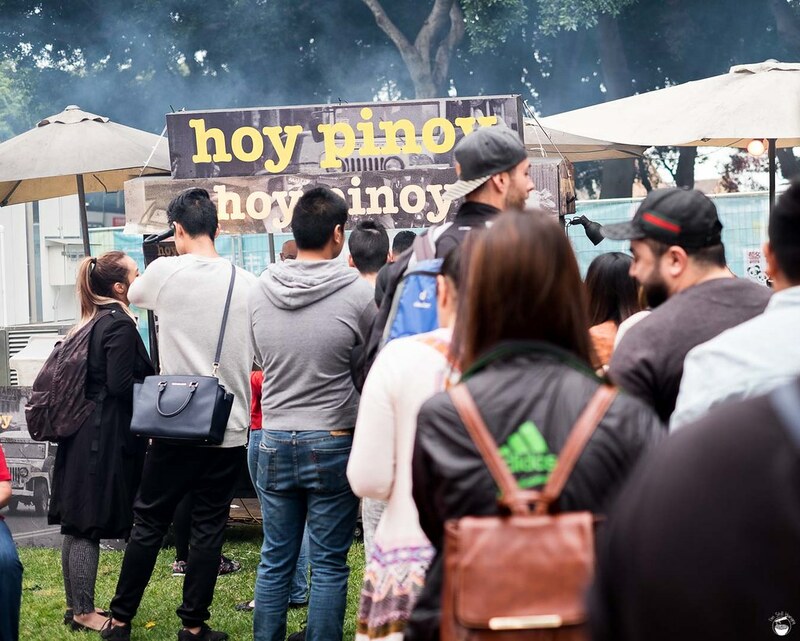 Well, not me – but the cool folks at Everybody Loves Ramen (the same guys that run Hoy Pinoy!). I have never heard of this place before, and I don’t think they have a restaurant. However as they say, let the food do the talking. 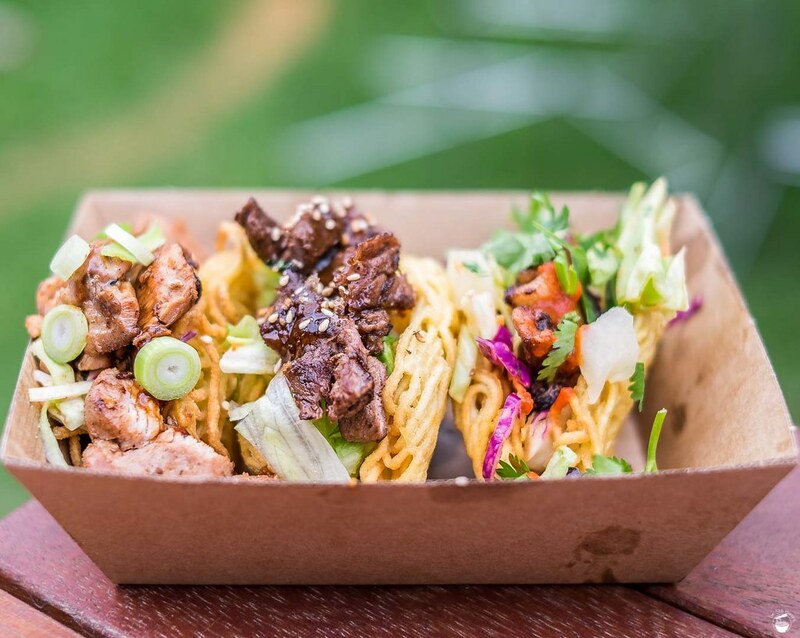 Tacos come in a trio for $18 with chicken, pork belly and beef. I think you can get more than 1 with the same ingredient, but variety wins, and I end up with all three. Don’t let the camera take too long with this – these tacos are best enjoyed immediately. In that state, the fillings are what makes these shine! The tacos themselves are made out of congealed but pre-made ramen noodles, which lend to slightly crispy end bits (the exterior edges of the tacos), while keeping a chewier centre that doesn’t fall apart – at all. However, they won’t taste particularly fresh, a point to note. Construction-wise, they’re also a bit subpar – most of the filling is really outside the tacos, rather than within. Expect a multi-serviette job. My personal favourite is the chicken, as it’s cooked the best. The beef is nice, especially with the paired sweet sauce, but was a little bit tough. Similar story with the pork belly. The chicken though? That stuff’s legit. Chicken, sweet sauce, ramen. Can’t go wrong. Worth a try? Yes, worth a go. Perhaps not a second time though. Crave something similar? Give One Tea Lounge a try! If the ramen tacos aren’t to your liking, you could give the ramen fried chicken a go. Yes, you heard that right – ramen fried chicken. Thing is, there’s more than enough choice with respect to fried chicken at the Night Noodle Markets. Can the RFC win its way to our hearts? I’ll say this – it’s delicious chicken. Juicy meat, saucy exterior, plenty of flavour. Thing is, where’s the “ramen” aspect? I thought it would involve some quirky & clever trick where ramen noodles made up the batter, but it turns out it’s just ramen seasoning. That essentially translates into a sweet & salty flavour not unlike teriyaki. As such, it’s a juicy cup of chicken, but it doesn’t do anything to stand out. Then again, while you’re there, you might as well? Gua bao – hen hao! Yep, that’s the David Bao-wy (oh the puns). 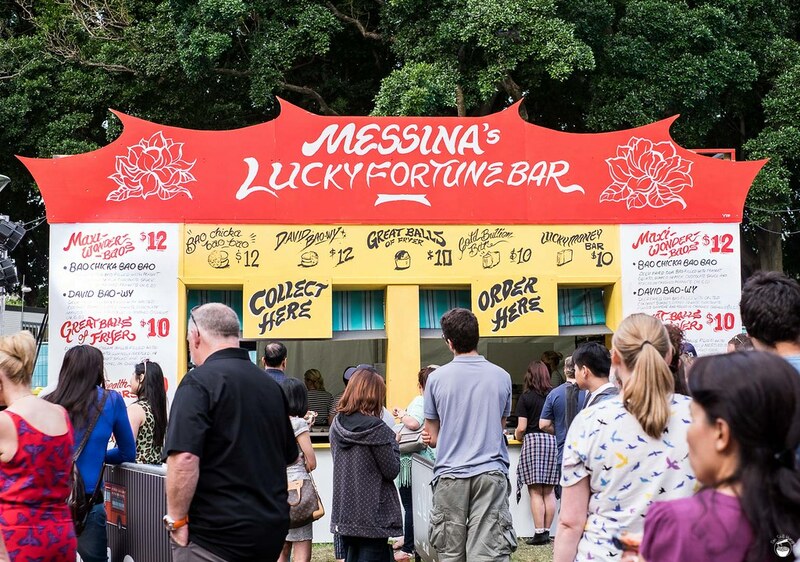 Gua bao have been making waves in 2015, and Messina is all about being on trend. This may look like a gimmick – and really, it is – however the flavour doesn’t lie. This is really good and totally worth it a second time. 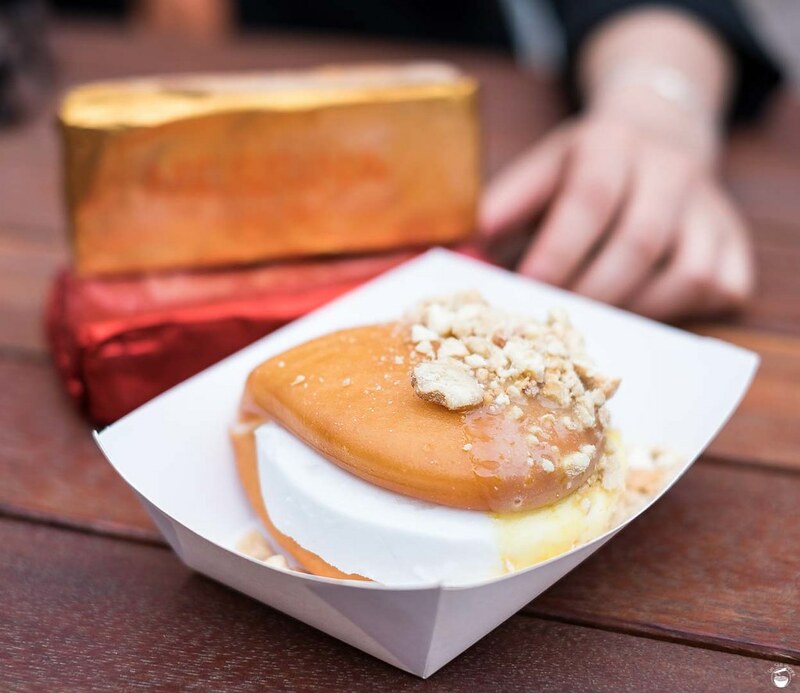 The David Bao-wy: deep fried gua bao filled w/salted coconut sorbet, dipped in nuts, chocolate mango ganache and rolled in crushed cashews. The bun is light and fluffy within, while maintaining that classic exterior crunch only deep-frying can imbue. Within is a pure white, refreshingly coconut-y sorbet that fully addresses any heaviness from the bun. The whole thing is rounded off by a smidgeon of tartness from the mango ganache, and finished off with a nuttiness from the cashews. This is the bao for those who crave something even richer than the David Bao-wy. 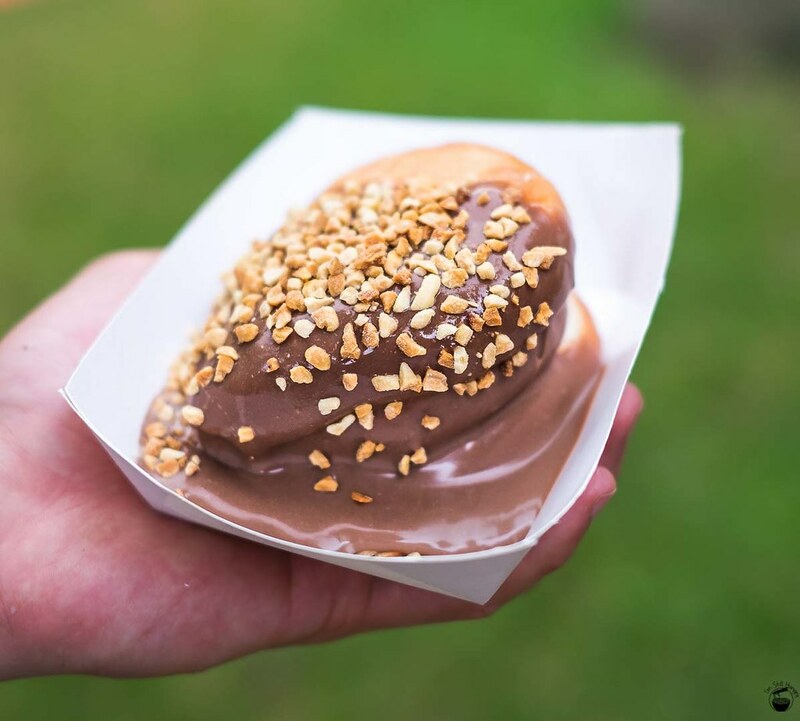 This is all about the nutty gelato that Messina is famous for, plus an absolute slathering of chocolate sauce, and oodles of texture from crushed peanuts. The bao is of the same crispy, fluffy nature as the David Bao-wy (I expect nothing less), the gelato is classic Messina quality, but the most endearing element of the bao chicka bao bao is that milk chocolate sauce. Smooth, sweet, and I’ll be damned if it doesn’t absolutely slay the chocolate monster within you. This is just so off the hook! It certainly did for me, that’s for sure. I smashed almost an entire one, and I’d happily chow down another. Hey, everybody needs carbs, right? Do believe me when I say that it arrived encased in gold foil – I truly felt wealthy with such a sizable gelato gold bullion bar. This is a hefty dessert, do share! 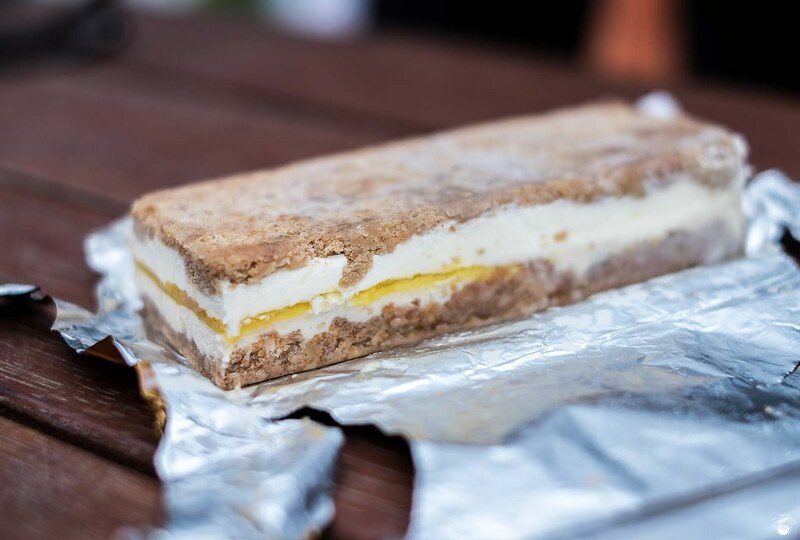 In actually eating it, you’re best served by taking direct bites out it like an ice cream sandwich. It’s very difficult to cut with plastic cutlery – your knives/forks will cave before the sandwich. That said, a concerted effort can pay off! Now this is where it’s at. For the same $10 price tag, the lucky money bar is significantly bigger than the gold bullion bar, and a lot more delicious to boot! 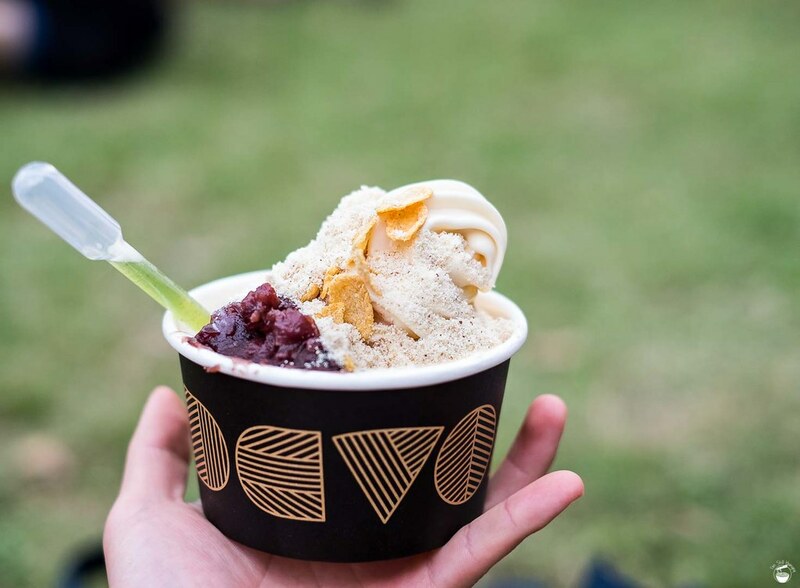 The flavours were in far greater harmony with the textures for this one – coconut gelato & pandan go together like bread and butter, mango and a friable cocount biscuit also make for a great pairing. The result is a no-questions-asked recommendation from me. Just make sure you have someone to share it with – no seriously, you want to make room for other food. The struggle to choose is all too real – so I simply ate both! 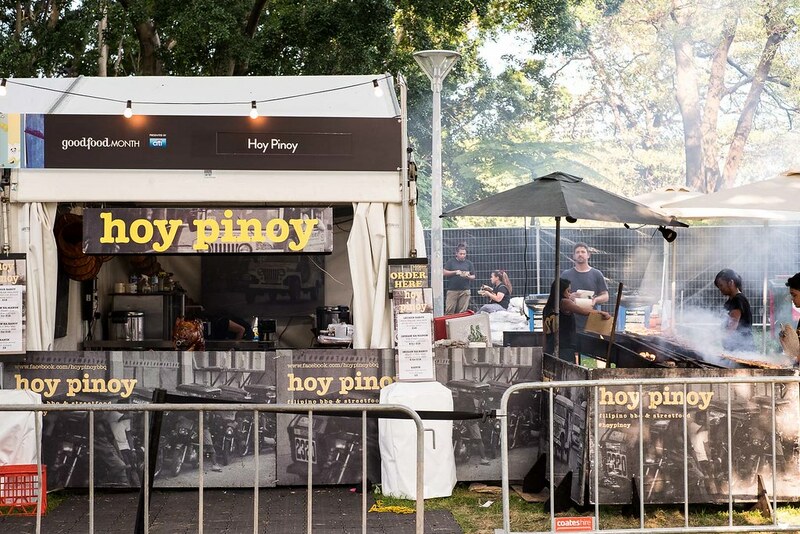 As of 2012, it ain’t no Night Noodle Markets unless Hoy Pinoy is present. 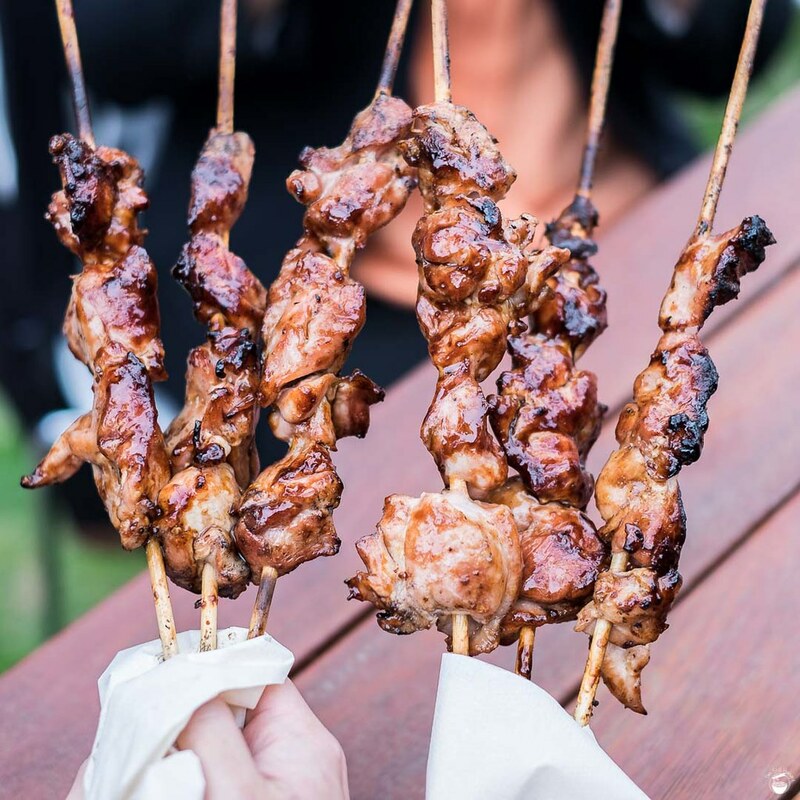 These Filo BBQ experts do skewers like nobody else, and are easily the best of the show (sorry Daniel San!). You can find them pretty easily – just look for the clouds of billowing smoke. 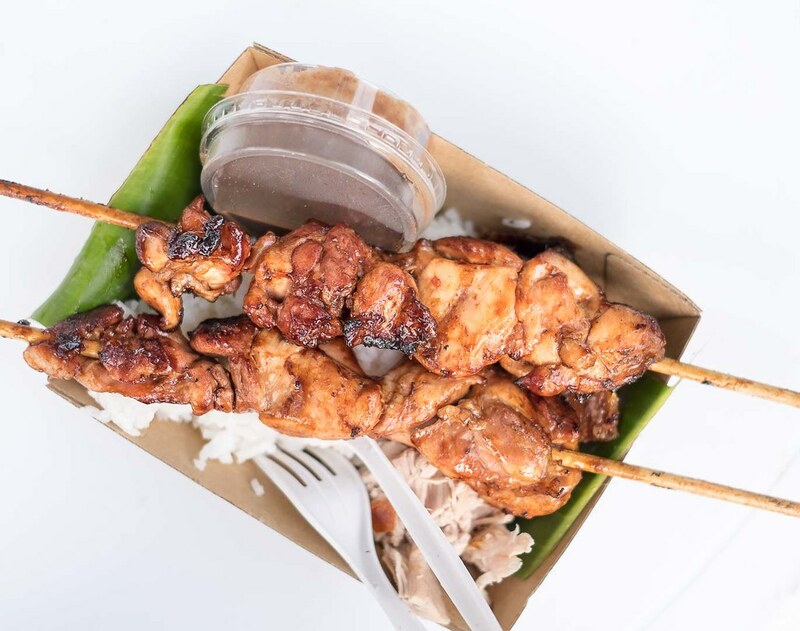 There are two locations – one’s at Truck Stop (chicken skewers only), while the other is towards the Southern end of Hyde Park which serves a fuller menu – including whole spit-roasted pig! The pictures here are of the smaller stall. As for the big one? Keep scrolling! For now, skewers are what I had, which come in pairs for $12. 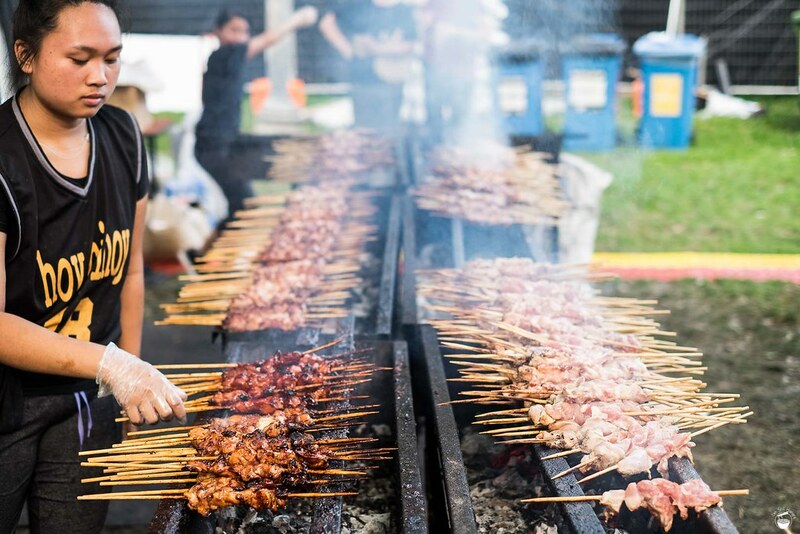 It’s more $ than last year, but you also get more meat for your buck – the skewers really are bigger. That said, I did wish they’d stick to the $10 price point and keep the meat a bit smaller. That would give more relative surface area for the sauce to coat. Still pretty good! 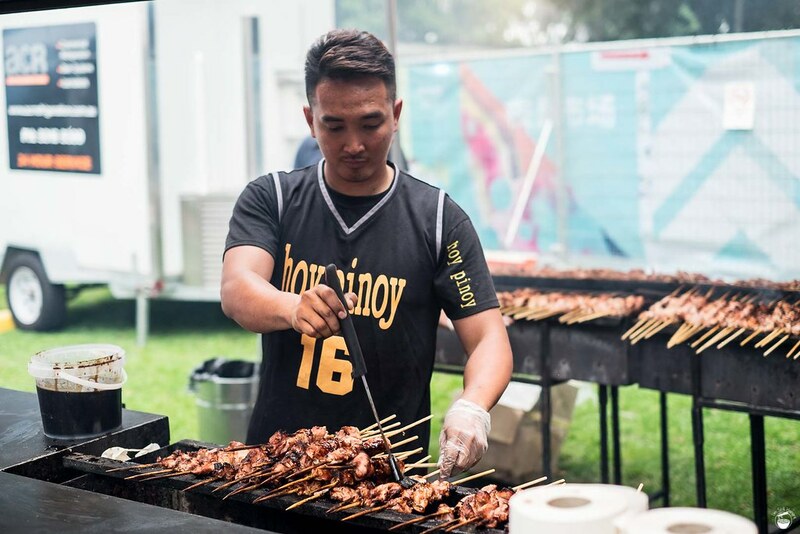 Speaking of sauce, that’s what gives Hoy Pinoy its flair – it’s not the excellently charcoal-grilled chicken (though that definitely plays a part). It’s a uniquely Filipino condiment called banana ketchup. Think of it as their answer to maple syrup (as a savoury condiment). It’s sticky, it’s sweet but it’s also savoury & smoky. I could eat these skewers for days. As for that spit-roasted pig? Here we go! Yes. That is literally a whole, spit-roasted pig. Just. Look. At. That. Those char marks, that glisten, OH THE SWINE. I’m ready to eat, yo. 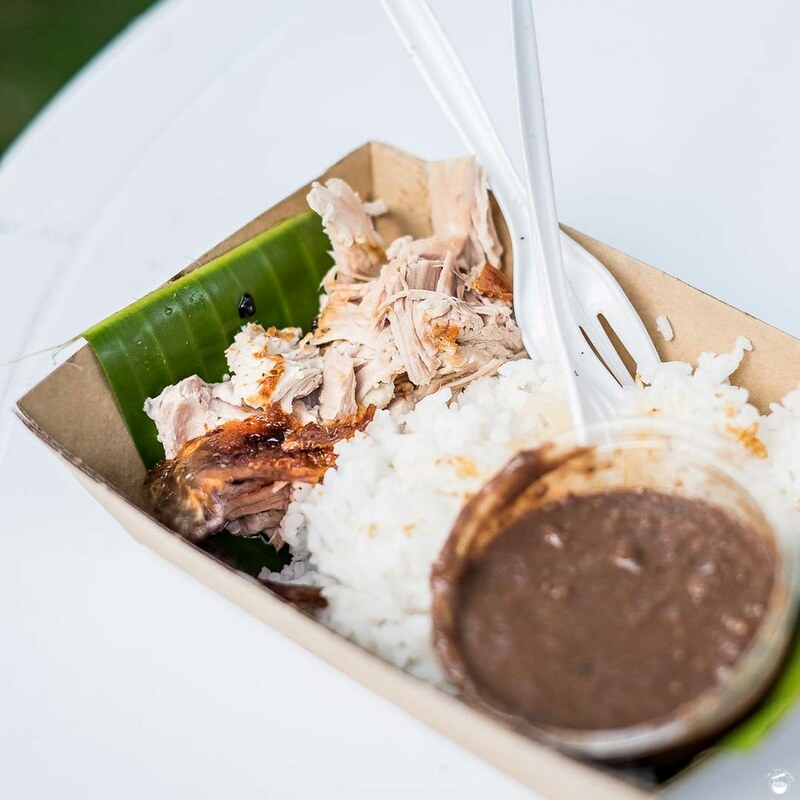 The basis of the dish is that it’s essentially pork & its associated crackling served with rice, a pungent, pig liver-rich sauce known as lechon sauce (Lechon = “whole pig” – thanks for the tip Raff! ), and papaya pickles called atchara. The pork is expectedly delicious – hard & crunchy crackling (bring your jaw game), with moist-enough meat that while not packed with the flavour I was expecting, is greatly assisted by the pungent sauce. It’s really, really delicious – think of a sweet, liver/paté kind of taste that matches the pork perfectly, and pretty much caused me to devour all of the available rice. Whoops. Worth getting? For sure – and be sure to eat it fresh! Oh, and because those skewers are just so good, we got those again too. I mean it when I say they’re the shiz! Chicken ft pork ft rice ft lechon. Dinner is sorted yo. This ends my coverage on Hoy Pinoy – I need not convince you further! And now, some venue photos! It ain’t over till the fat cat sings! Get in early and you will actually find seating! Thanks for the compliments Cathy! 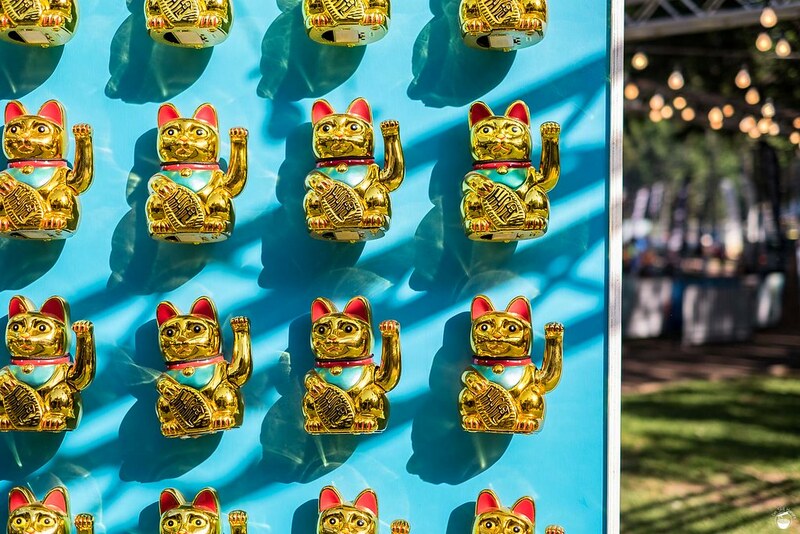 Unfortunately, you’re out of time – the Night Noodle Markets ended tonight! 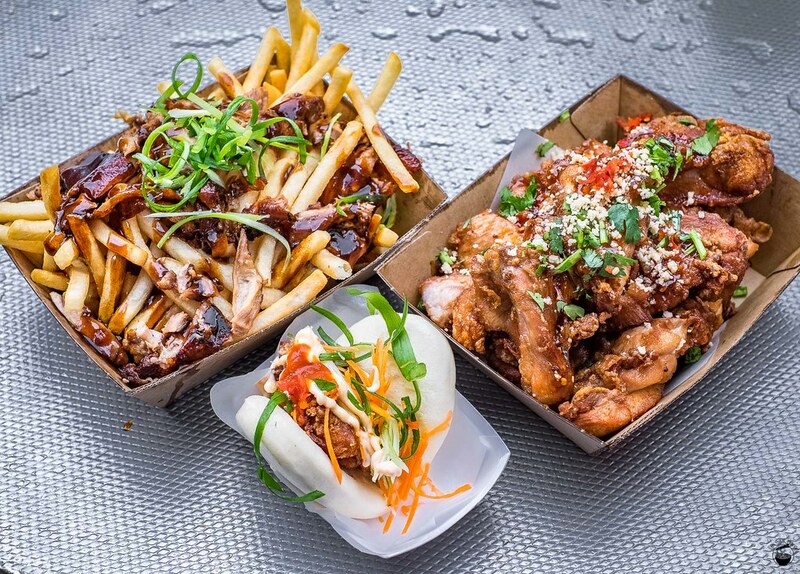 You can find Bao Stop as a popup by following their Instagram to see where they’ll pop up next. I’m not as sure about Hoy Pinoy. Best of luck! This is amazing! I wish I had seen this sooner before heading there last week. It was so overwhelming for a first timer! I love that all the portions are relatively small- all the more for me to try! I’ll definitely be heading back and trying out some of your picks! Oh goodness, indeed if only you had stumbled upon the post sooner. Unfortunately, you only have tomorrow night left – get in quick! Whoah epic post that just keeps on giving! Loved the belacan chicken wings, and the lechon was such a treat. Thanks! 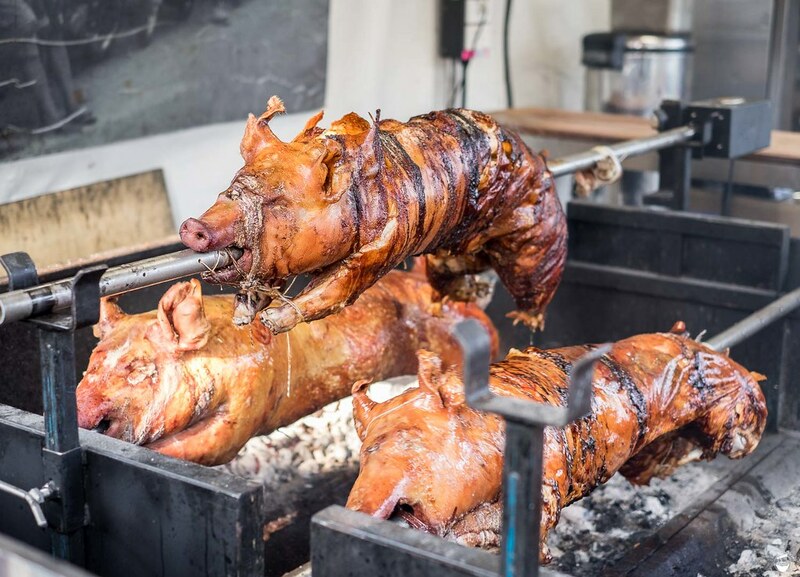 The lechon was definitely something new to me, I’m glad I got to try it – will definitely be looking forward to that next year! Also thanks for the clarification on lechon (whole pig) vs lechon sauce! Deeeeeeeelicious! Overcrowding, high prices and a lack of general quality seem to be the three most common criticisms on the NNM. They’re all valid, to be honest. Fortunately, you can address overcrowding by getting there early (I personally never hit NNM after 6:30 – it’s too much to bear at that point). Comprehensive as always Michael, hoping to get there this year but the schedule is crazy crazy! !